(Monroe CT) It was a passing down, but Newtown opted instead for a run up the middle. 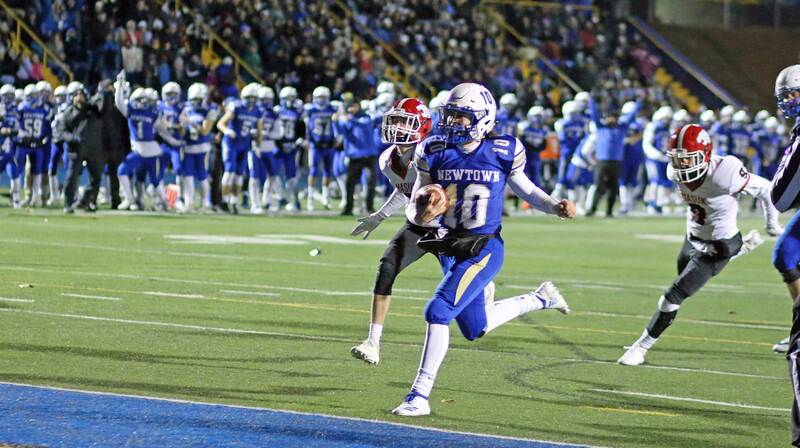 The result was a momentum-changing 49-yard touchdown shocker by Dan Mason and Newtown went on to defeat undefeated Masuk, 14-7. “Cold” doesn’t come close to describing the weather conditions on the Wednesday pre-Thanksgiving event at Benedict Field. Add an occasional gale-force wind to the low temperatures and you could imagine the discomfort. 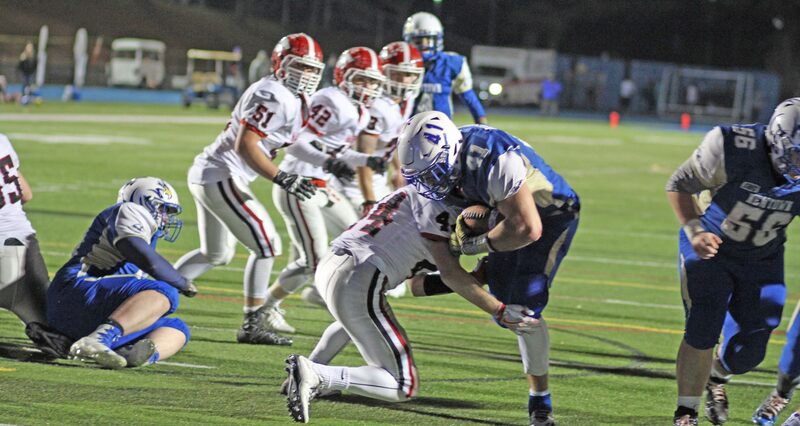 Two years ago, Ben Mason the linebacker became Ben ball-carrier having a five-touchdown evening leading the 2015 Nighthawks to a 40-8 rout over Masuk. 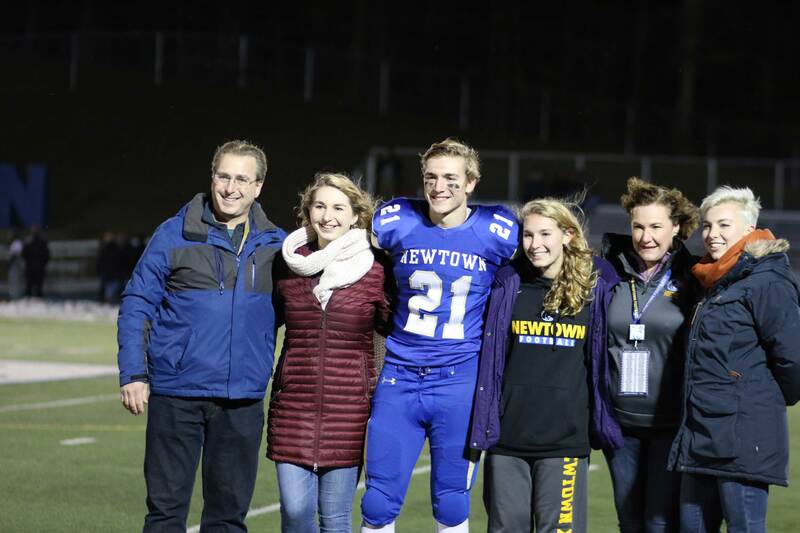 Ben’s brother Dan didn’t get five TDs on this evening but he got two and that was enough to earn Newtown a sixth straight win over the Panthers (9-1). 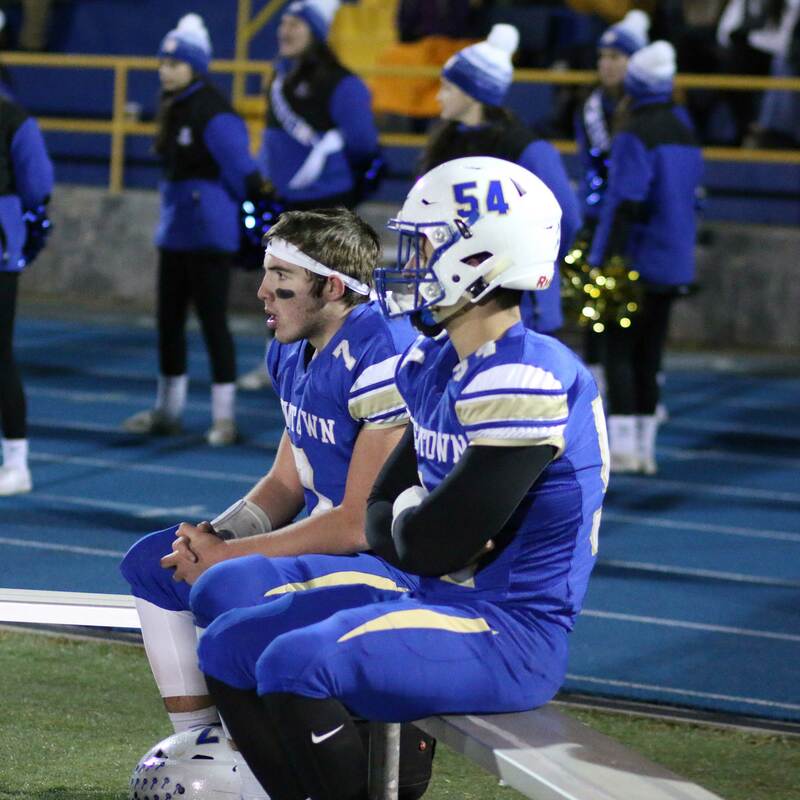 The Nighthawks (7-3) showed in the first half that they were not going to be another team rolled over by Masuk’s high-scoring offense. 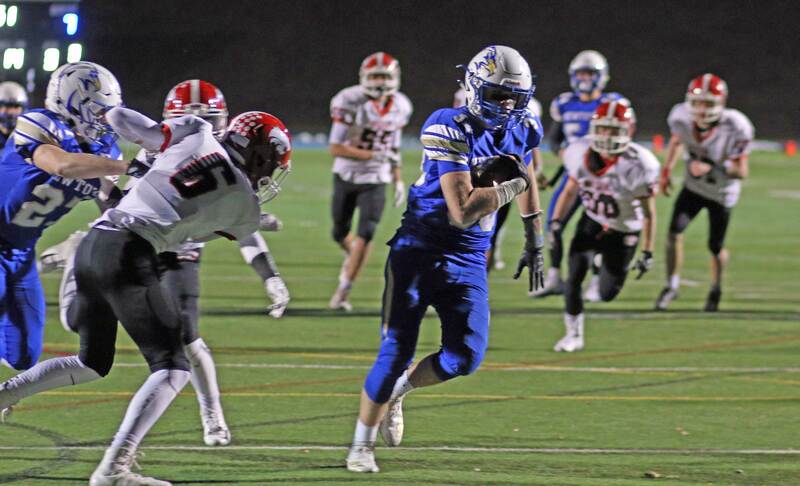 The Panthers, on occasion, did look like the teams that had 401 points in nine games, but Newtown limited lengthy drives by pressuring QB Matt Hersch and containing Jack Roberge. “I’m quite sure that their quarterback hasn’t been sacked that many times in a game this year,” said NHS coach Bob Pattison afterwards. Masuk scored their only touchdown in the first quarter. Nicholas Lorusso ran a nice fade route into the right corner of the end zone and Matt Hersch delivered a perfect nine-yard pass (behind Connor Martin) for the early lead at 3:02. It was the 12th touchdown catch for Nicholas and the 31st touchdown pass for Matt. At the time, I thought that this would be the beginning of a parade of points for the undefeated Panthers. But it wasn’t. Why? Newtown got the stunning equalizer before the half and had the ground game to control the clock in the second half. Add a defense that held a team that had not been behind all season, and had scored at least twenty-points in every game, to one touchdown speaks for itself. Most important play? 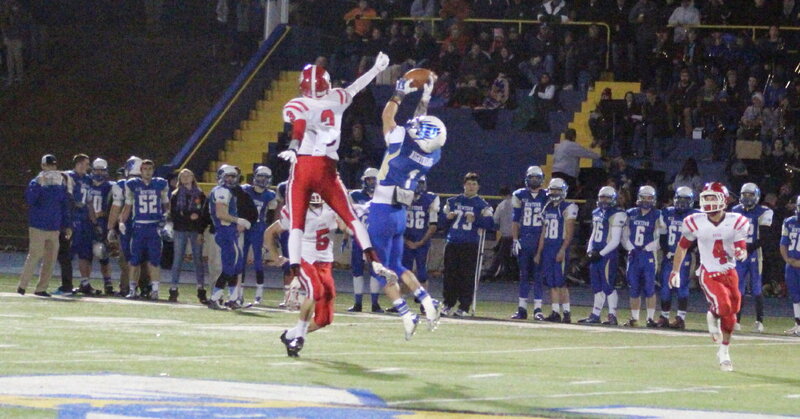 The Dan Mason touchdown at the end of the second quarter. With less than a minute left in the half and forty-nine yards to go it looked like a good time to go to the air. 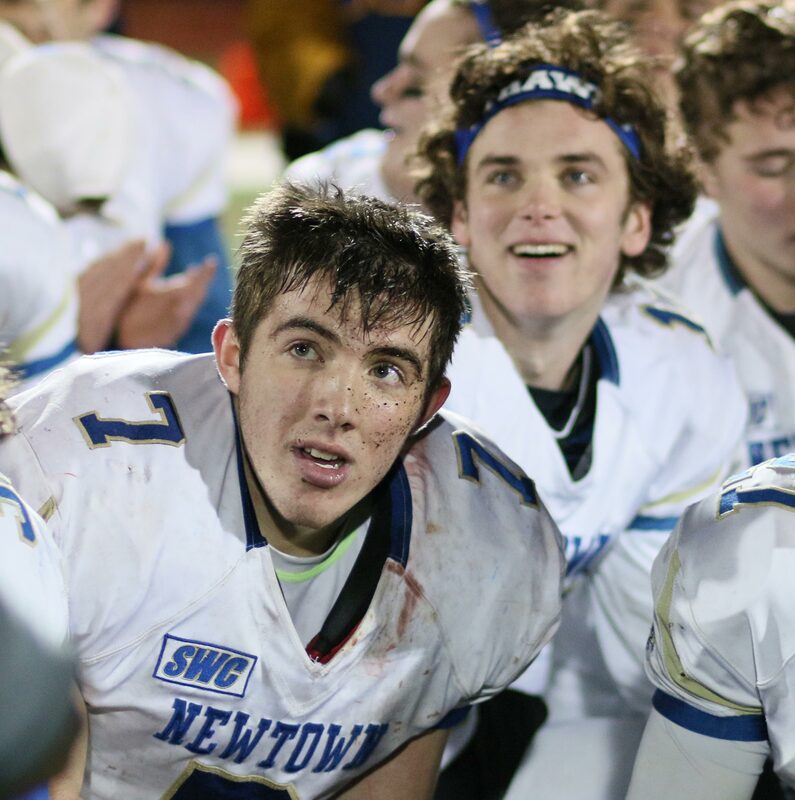 Newtown opted for a running play instead. “It was a passing down, but we thought we’d see what we could get with a quick hitter up the middle,” explained Coach Pattison. 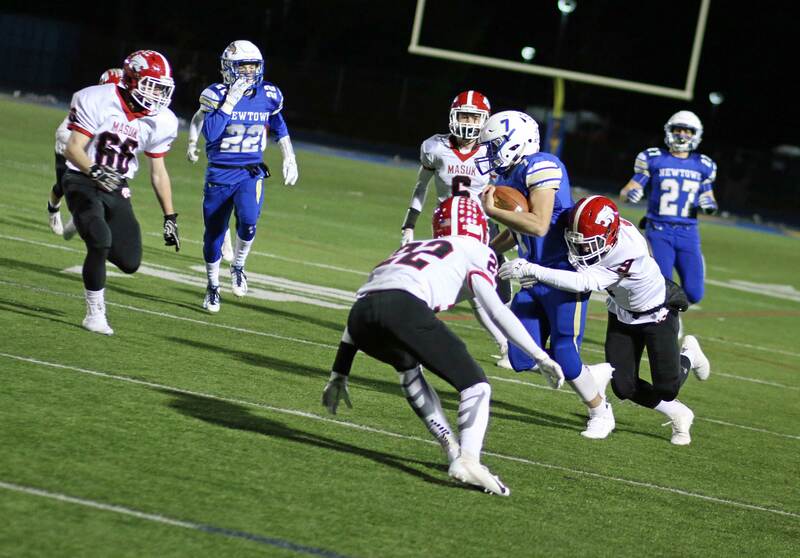 What they got was pure gold as Dan Mason followed a key block on the Masuk linebacker and then split the safeties into open territory. 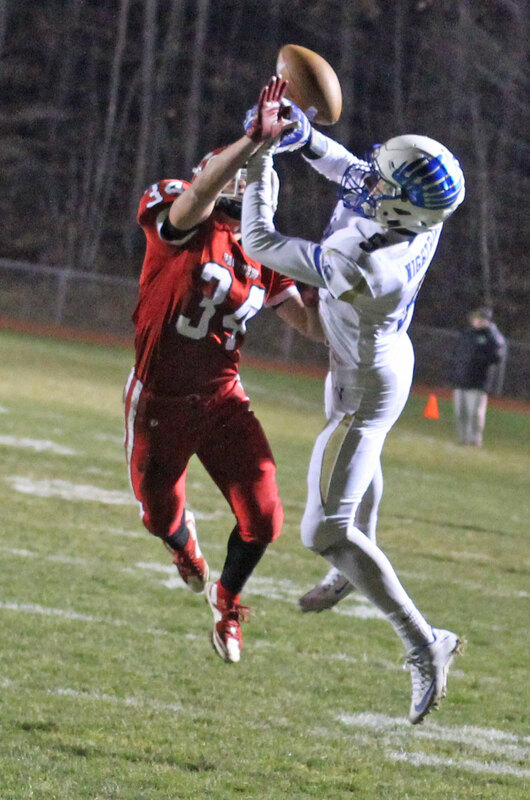 The team from Monroe had a promising second-half start when Robert Martinsky brought an interception back to the Newtown 17. 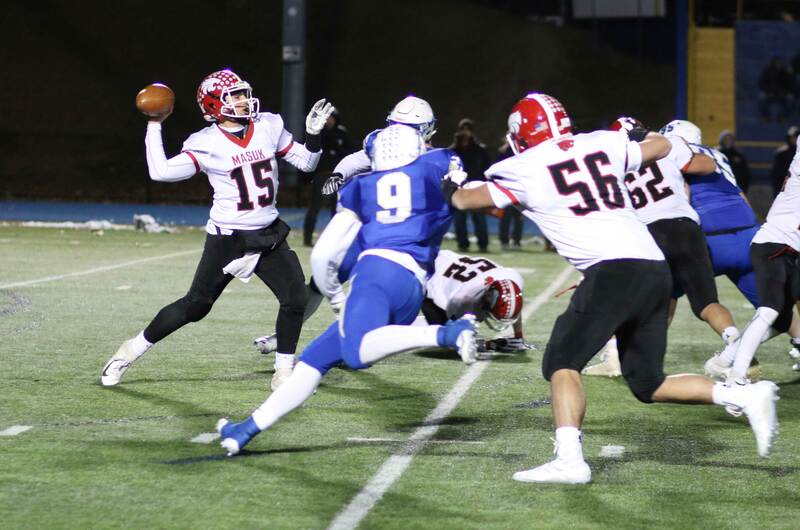 Enter the high-powered Masuk offense? Not on this evening. 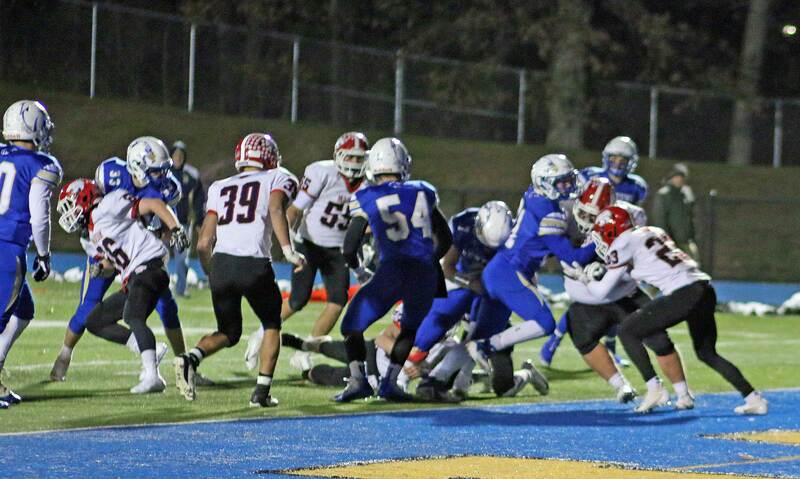 The Nighthawk defense held and then the wind sent Nolan McCarter’s 28-yard kick wide left. 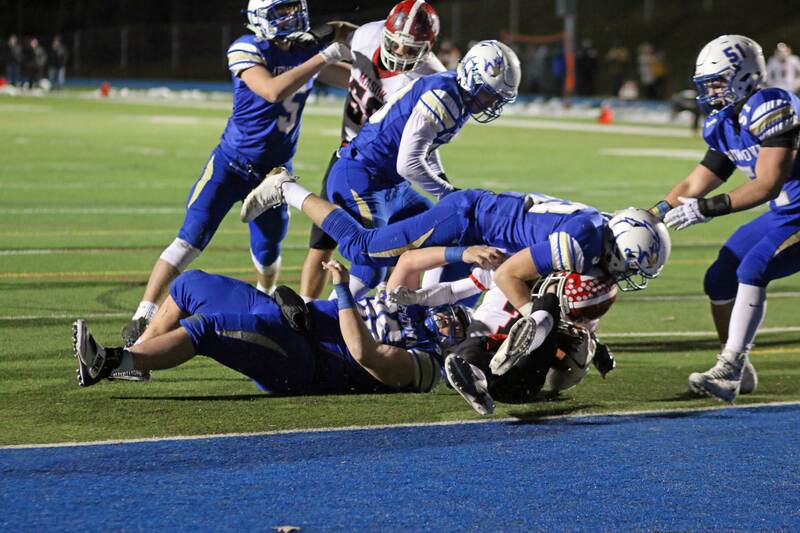 While the Nighthawks’ turnover wasn’t costly, the Panthers weren’t as fortunate after Jack Roberge fumbled and Joe Pagett recovered at the Masuk 33 with 3:24 left in the 3rd quarter. 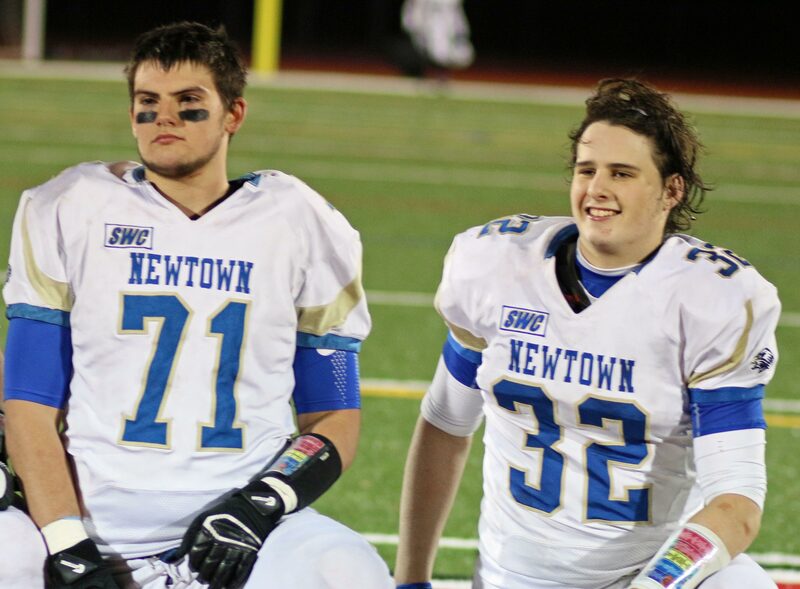 Patiently Newtown moved the ball, running the clock, and converting 4th downs along the way. 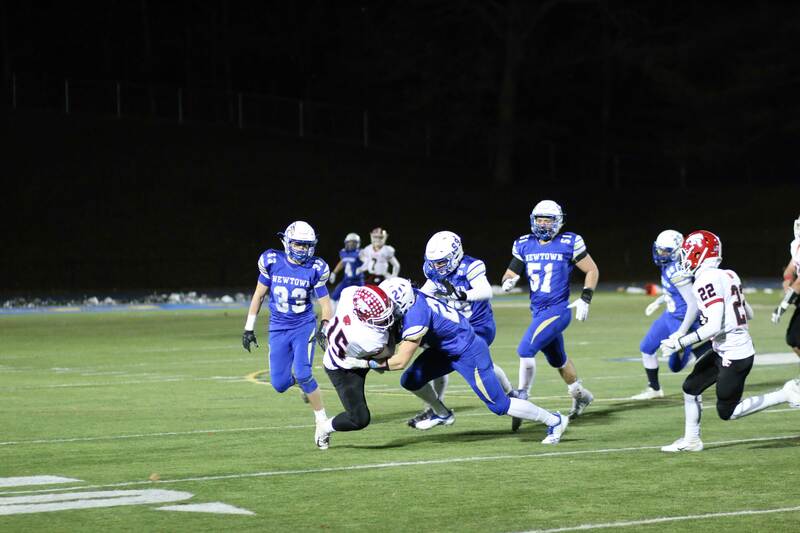 Dan Mason finished the job behind terrific blocking, rushing two yards into the end zone as the third quarter ended. The extra point confirmed that this was Newtown’s day! Joseph Lewis kicked wide right and was injured on the play. But there was a penalty on Masuk. No Joseph Lewis to kick? No problem. 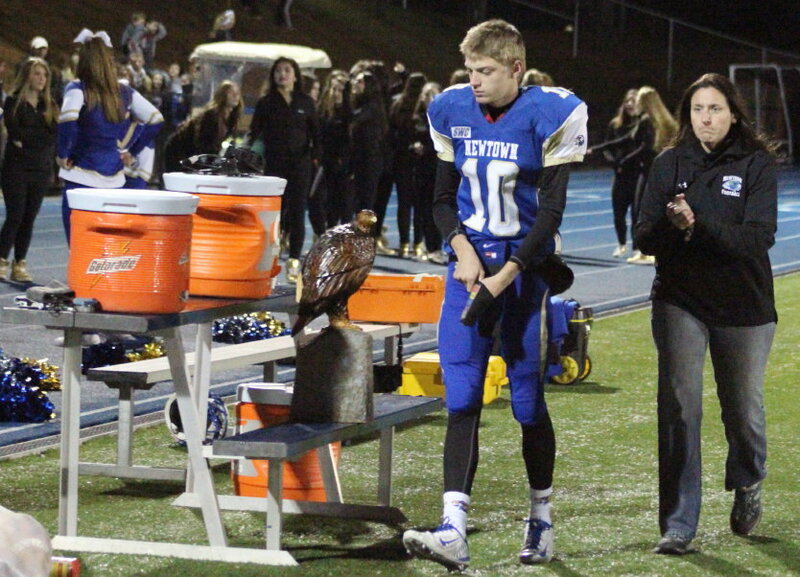 Quarterback Ryan Kost stepped in (He was Newtown’s kicker last year) and the extra point was added. An earlier confirmation of it not being Masuk’s day was on Robert Martinsky’s interception. 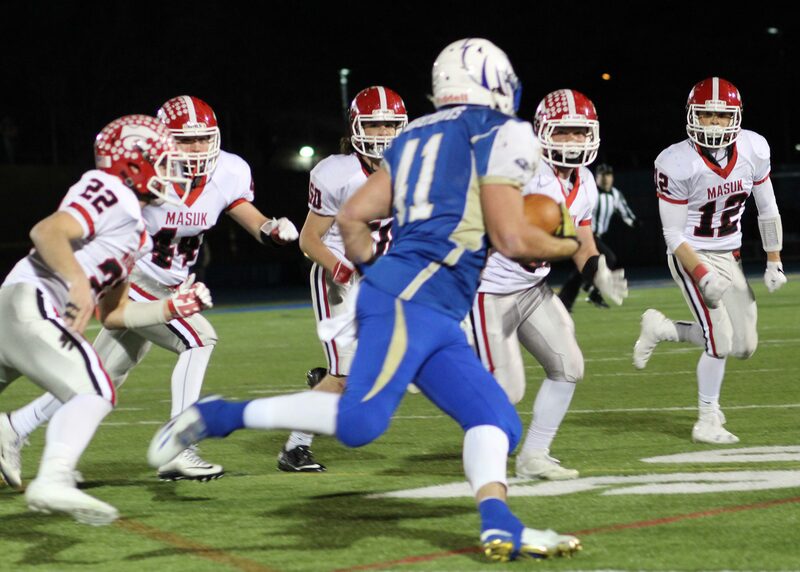 Looked like a pretty clear path to the end zone for Robert but the gathering Masuk blockers turned into obstacles and one of them forced Robert out at the Newtown seventeen. Why does this happen? For such an important game, why would the roster handout be messed up for Newtown? I was impressed with Masuk’s turf field. Great surface. I was at the Yale Bowl for the Harvard/Yale game Saturday on regular grass. Very slippery and uneven. Dan Mason two touchdowns gave him six for the 2017 season. I don’t doubt that he’ll have a few more next season. Coach Joe Lato went the trick play route late in the game as QB Matt Hersch handed off to Ryan Shaw and then went downfield for a pass. The wind got into Ryan’s pass, however, and Matt’s catch was way out-of-bounds. 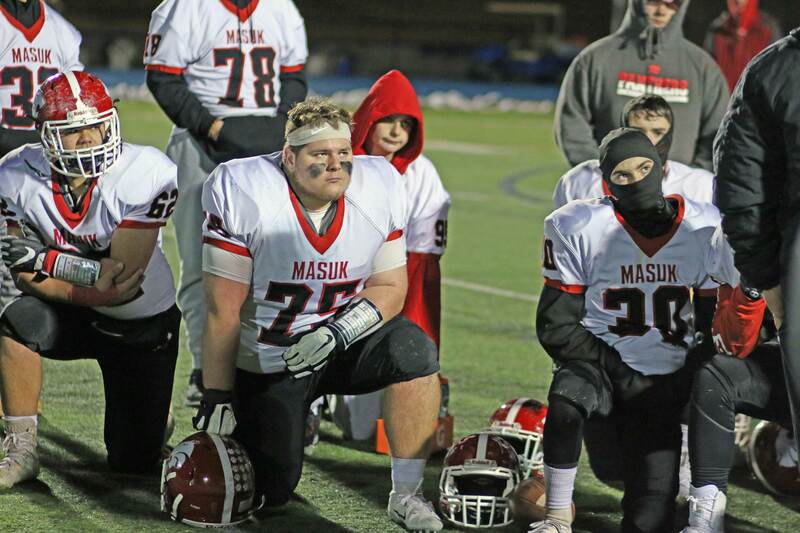 Good luck to Masuk in the playoffs. Tonight’s loss should toughen them up for the do-or-die games ahead. 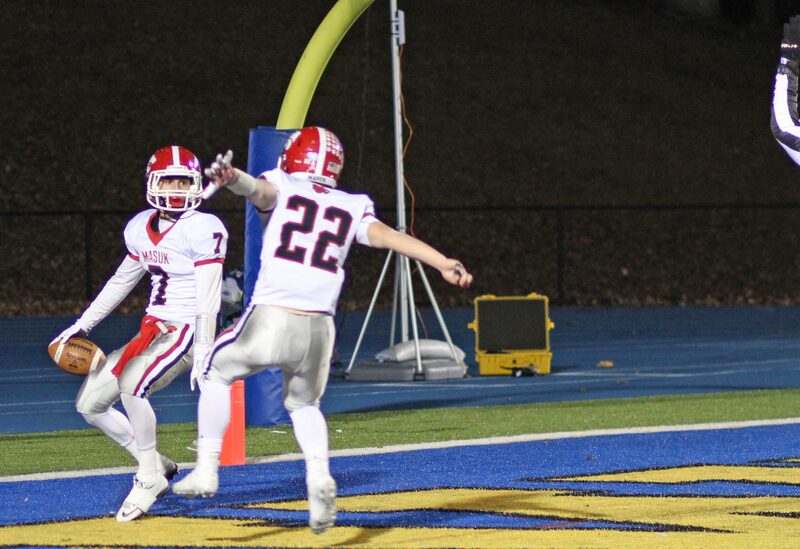 Mark Hall (1) celebrates his interception that ended the last Masuk chance. (Newtown CT) I’ll admit that I left the Newtown/Masuk, Thanksgiving Eve football game last year at halftime. Trust me, I wasn’t alone in 2015 heading home from Masuk as the Panthers trailed 34-0 after twenty-four minutes. Fast forward to Thanksgiving Eve of 2016. Same matchup, but what a difference! 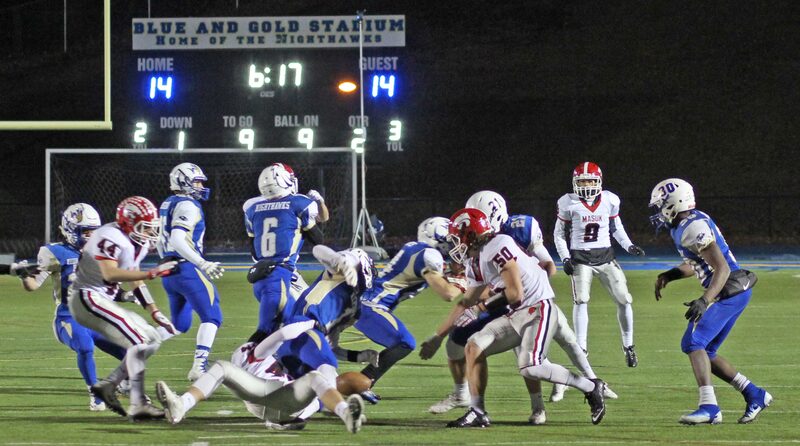 However, Masuk looked like the 2015 version in the first quarter (down 14-0) but rallied back thereafter to make an exciting game of it before losing 35-28 on a chilly Wednesday night at Blue and Gold Stadium. 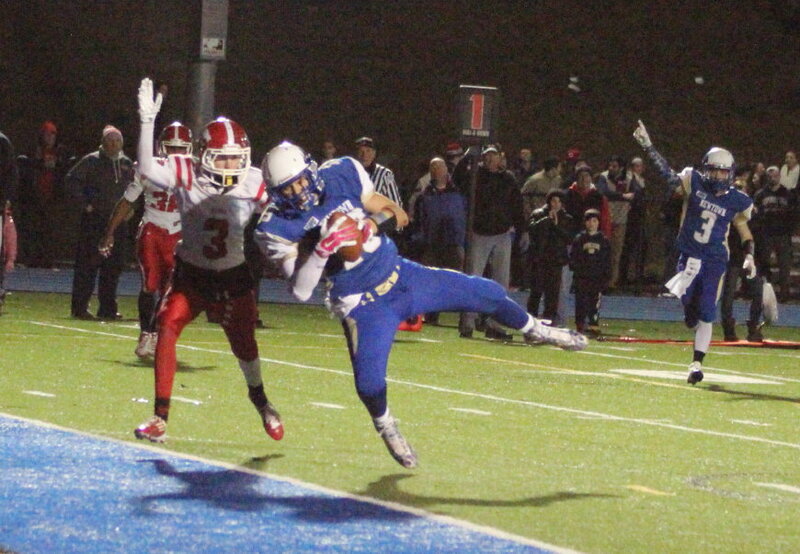 Newtown (10-0) needed two scores in the final five minutes to pull this one out. 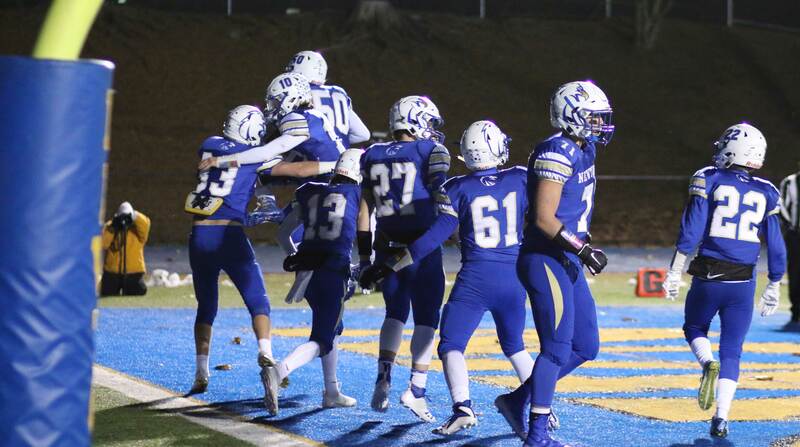 The final touchdown was essential for the Nighthawks after an extra-point block by Collin Briganti kept the visitors ahead, 28-27. 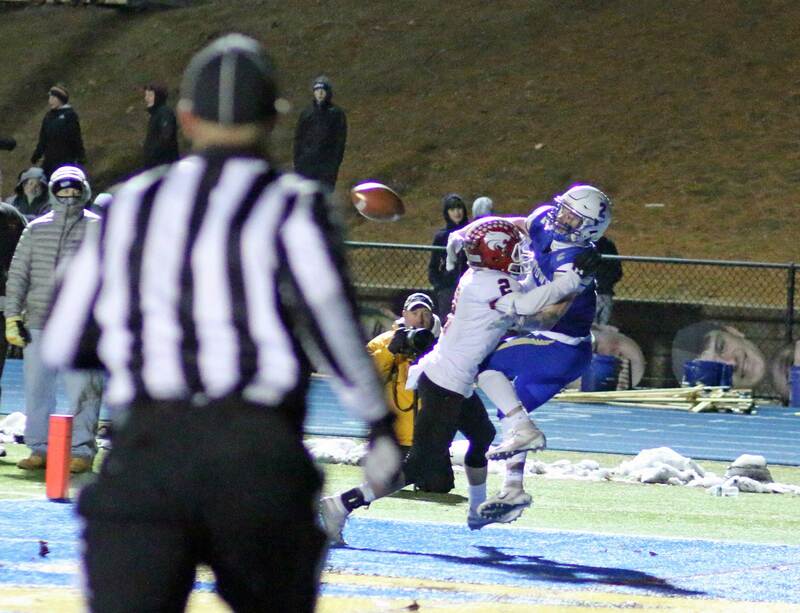 Masuk (7-3) would have been okay with that one-point lead if they could have moved the ball but they couldn’t. A run that went out of bounds and an incomplete pass stopped the clock twice and saved Newtown’s timeouts. The Hawks took over at the Masuk 38 with 3:14 left trailing by a point. The home team settled for the Ben Mason power game and were 4th-and-2 with 1:30 left. 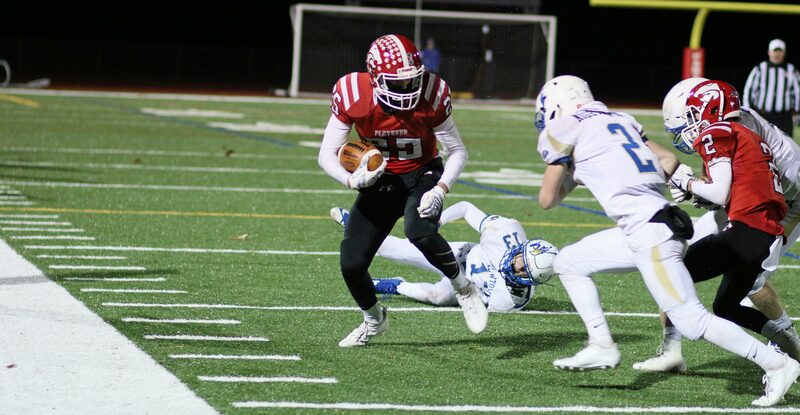 Whether it was a hard count by QB Justin Dunn or something else, the Masuk defense jumped offside and Newtown had more downs to work with from the Masuk 9. I thought that the Ben Mason power game inside would resume……so, it appeared, did Masuk. 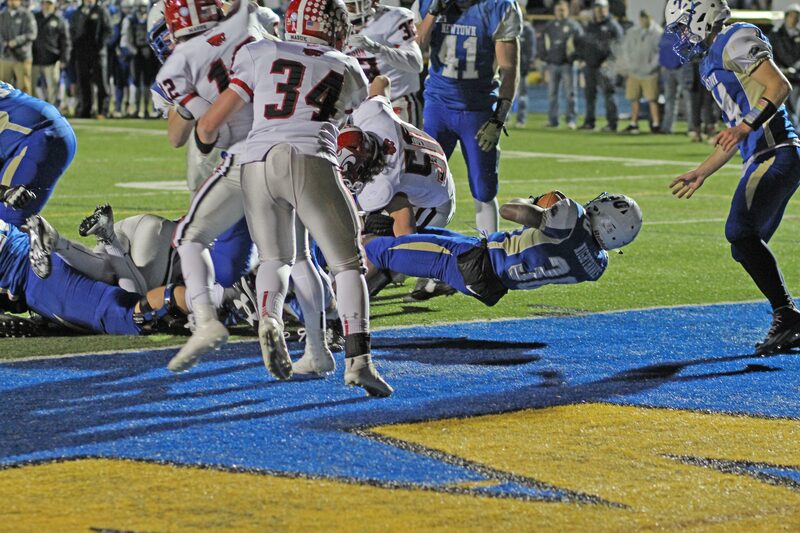 The defense got caught inside and junior Michael Garner floated free to the outside. Quarterback Justin Dunn, with terrific blocking all game, rolled right and spotted the wide-open receiver with 1:24 to go and connected for the game winner. It wasn’t that Masuk hadn’t seen the play before. The Hawks had used the same play, same personnel to get the same result three minutes earlier in the final quarter. There was still time (1:24) left for Masuk to answer. However, a Matt Hersch pass to Ryan Shaw bounced off the junior and into the hands of defender Mark Hull. Game. Set. Match. 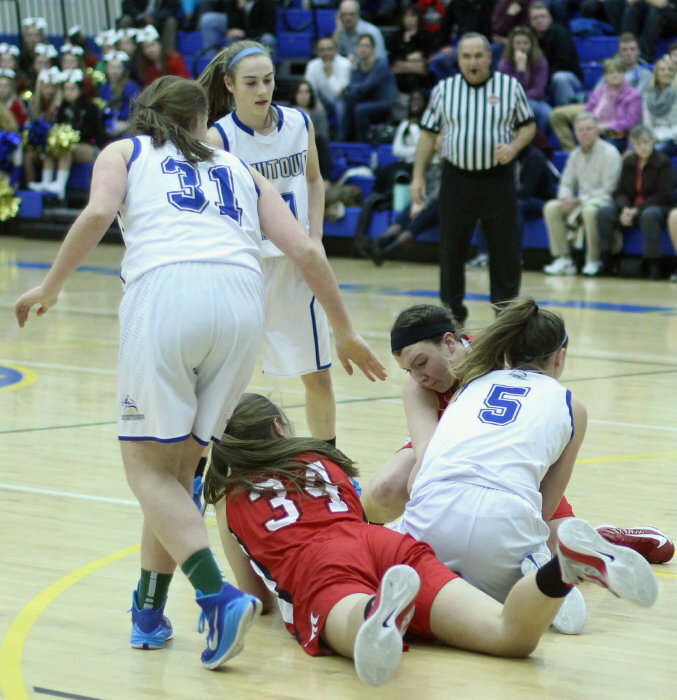 What helped Masuk make a game of it was a Hunter Cobb injury in the second quarter. 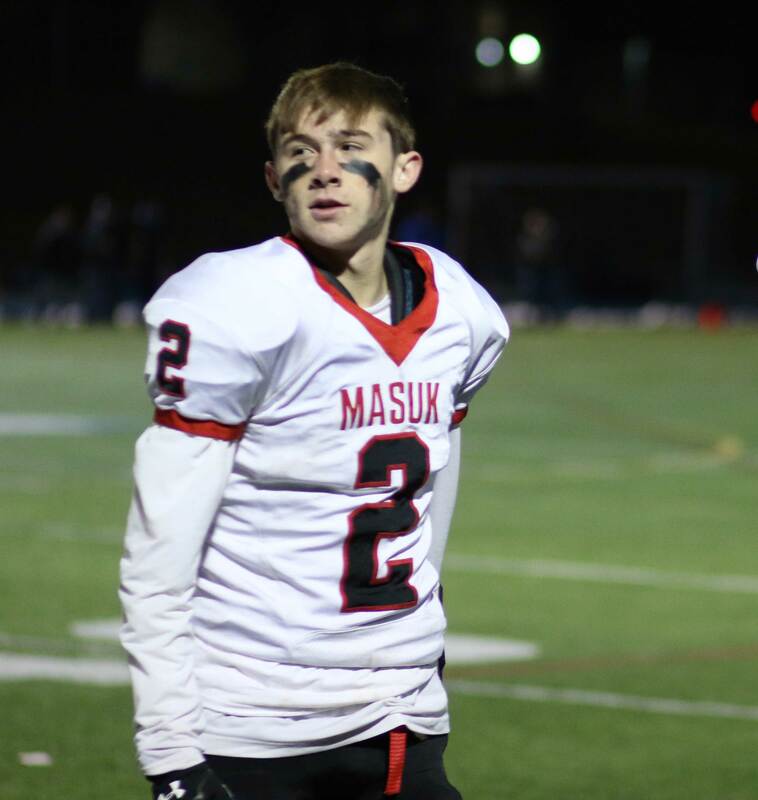 After Masuk had rallied to tie the score in the second quarter, Hunter went down with a leg injury after a pass reception and never returned to action. 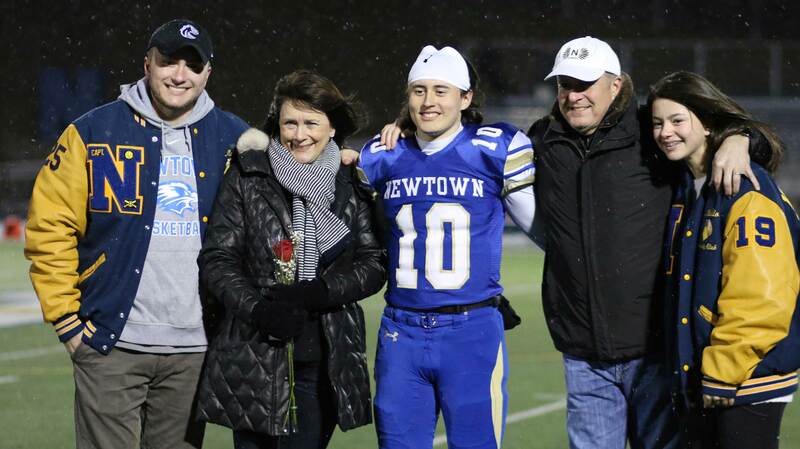 Prior to his departure, Hunter had registered both Newtown scores including a special second one that set the single-season Newtown record for touchdowns (30). Without Hunter, the Newtown offense became more predictable (inside power) but the home-run pass plays in the second half worked as a result. 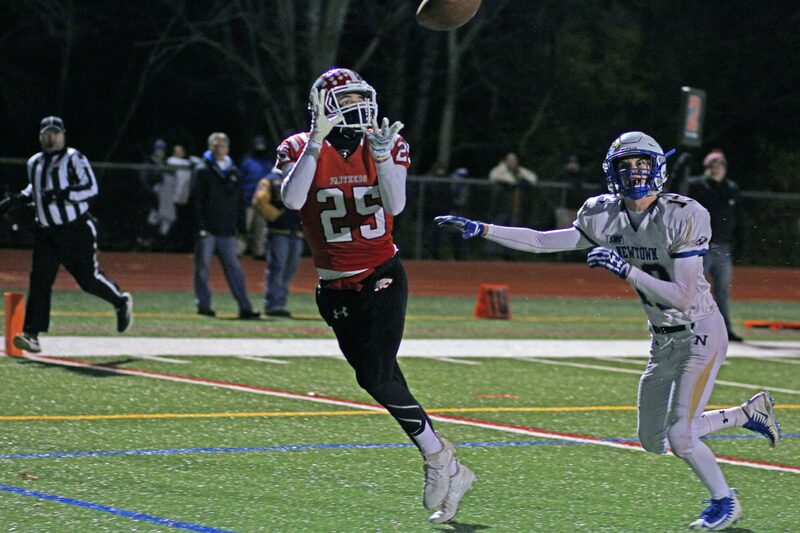 Masuk lost defensive numbers in the secondary in their concern for Newtown’s inside game. The Nighthawk’s quarterback Justin Dunn had excellent protection and his receivers had time to get open. The Masuk passing attack was surprisingly effective after the first quarter. QB Matt Hersch was on target and he had receivers (Nick Dellapiano, Ryan Shaw, and Michael Zuk) with speed to get deep as well as catching ability. Matt tossed three TD passes in this game to put him at thirty for the season. 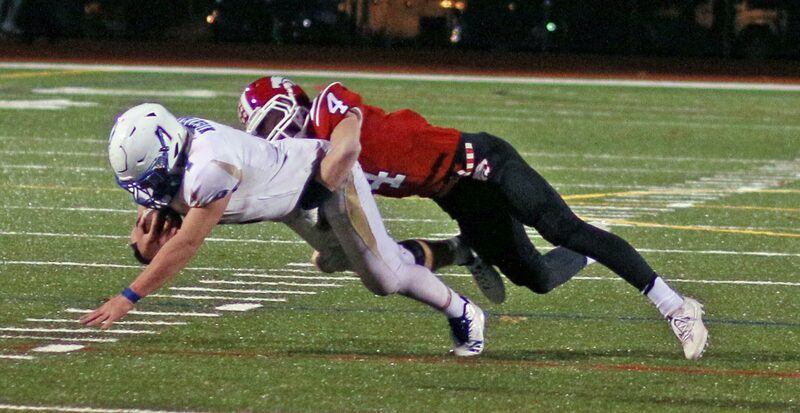 Masuk punter Peter Fox’s attempt to run for a first down backfired in the first quarter. Ben Mason had five touchdowns versus Masuk in 2015. QB Justin Dunn scrambled for several first downs. A Hunter Cobb pick-six in the first half was brought back because of a penalty. Panther Jack Roberge found big yards up the middle on two shuffle passes. 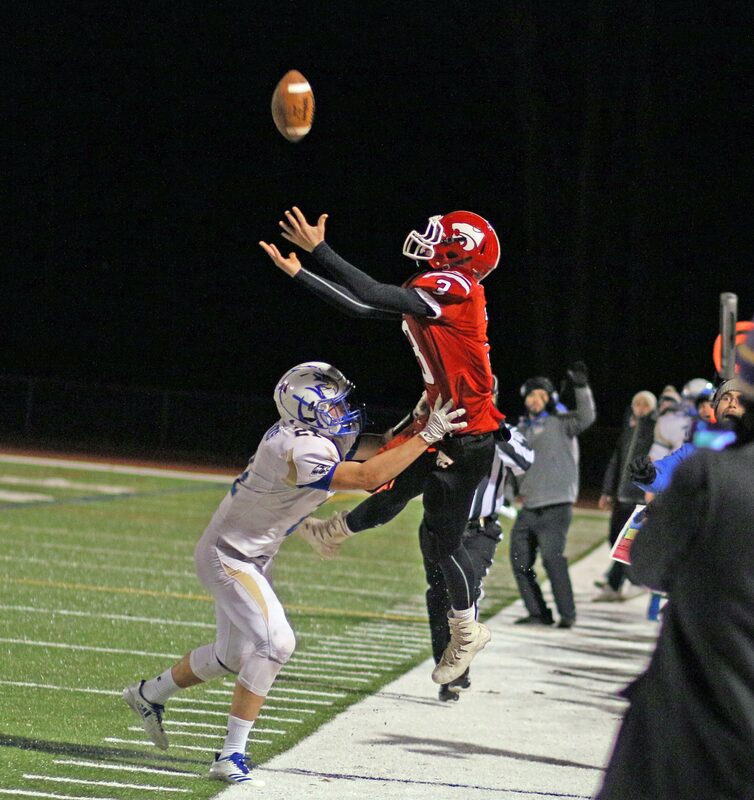 Masuk had the chance to take a 3-point lead on the last play of the first half but Nolan McCarter’s field goal attempt went wide left. This game had a chilly start but once the back-and-forth action kicked in I hardly noticed it. The NHS dance team and cheerleaders were excellent as usual performing at halftime. 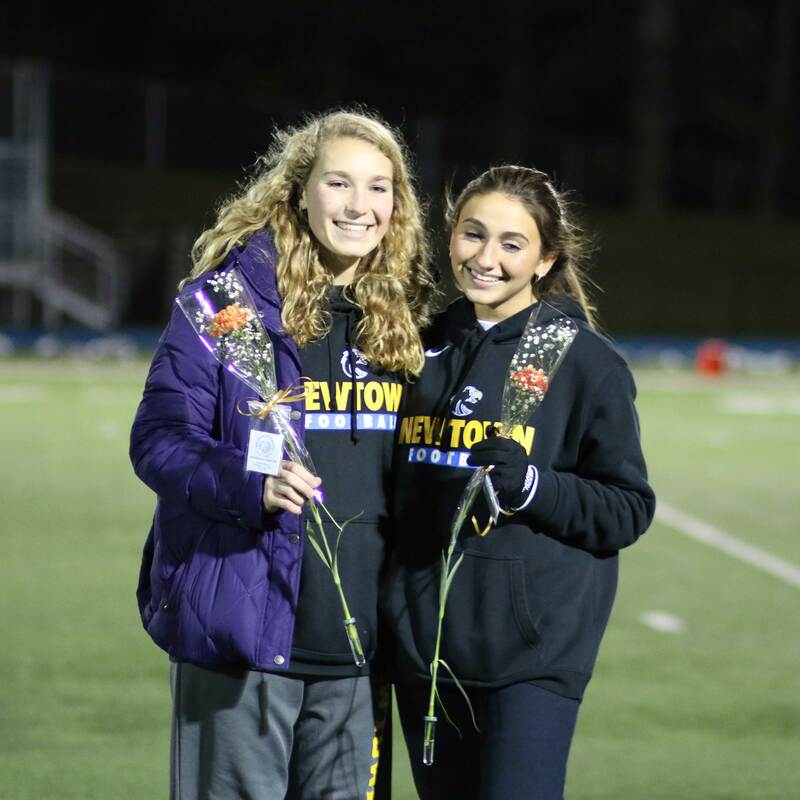 Newtown seniors were honored before the game. 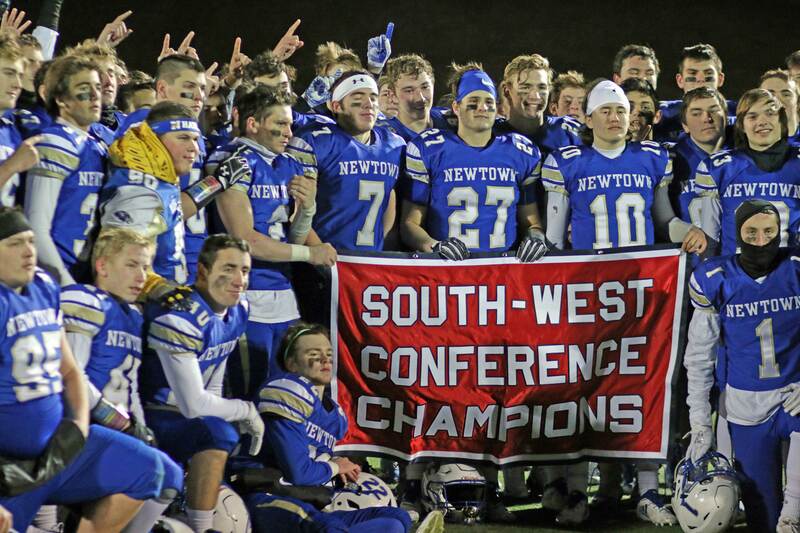 Newtown has only lost once in South-West Conference games in five seasons. 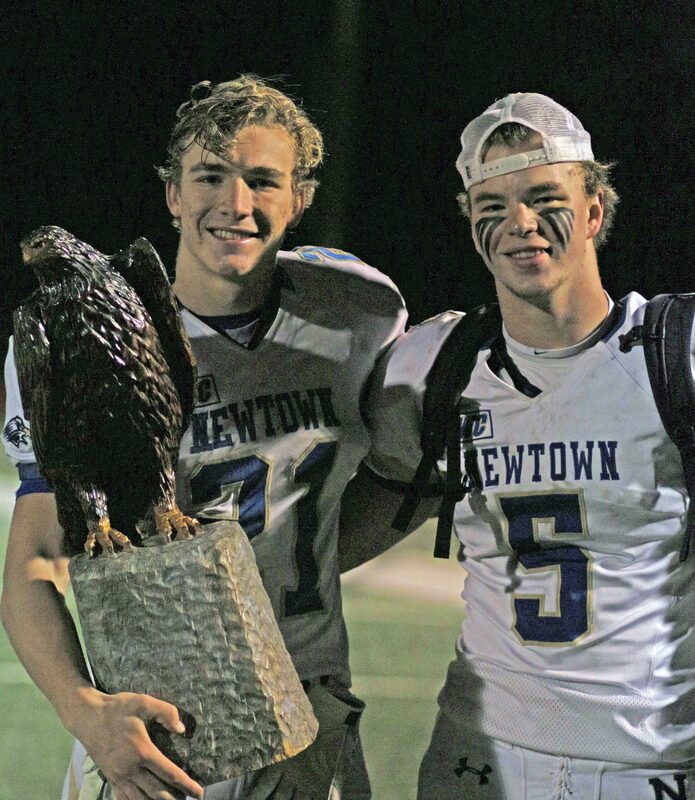 Newtown’s Ben Mason is signed on with Michigan while lineman Seth Willis will attend Brigham Young. Ben Mason found plenty of daylight and the end zone five times in a career game on offense. (Monroe CT) Remember Ben Mason the 6-3/240 pound defensive standout? Eighty-seven tackles and four interceptions. On Thanksgiving Eve the Newtown coaching staff decided to feature Ben Mason on the offensive side of things against Masuk. Did he ever make an impression! 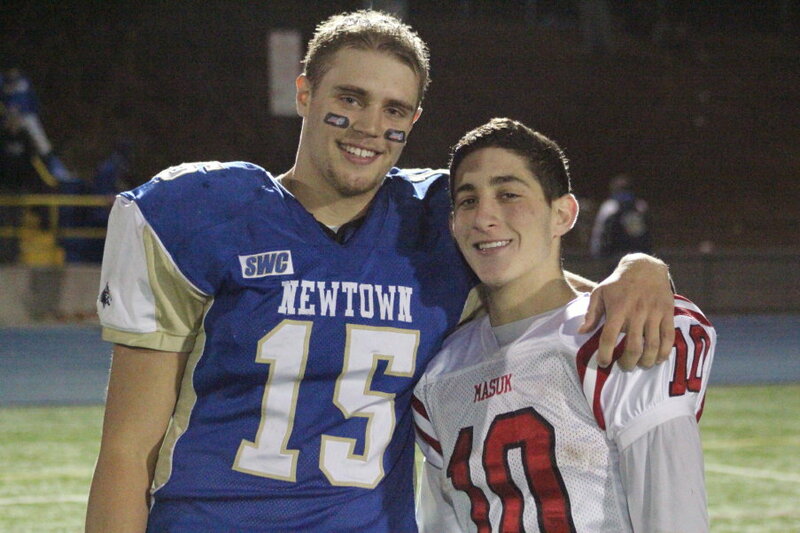 Ben was a key piece in Newtown’s 40-8 thrashing of the Panthers on chilly Wednesday night at Masuk. Ben’s stats? Fourteen carries. 120 yards. Five touchdowns. Ben had played offense before (nine carries in 2015) but obviously in a limited fashion. Now the cat is out of the bag and down-the-road playoff opponents (selections announced Friday) will have another thing to consider defensively. 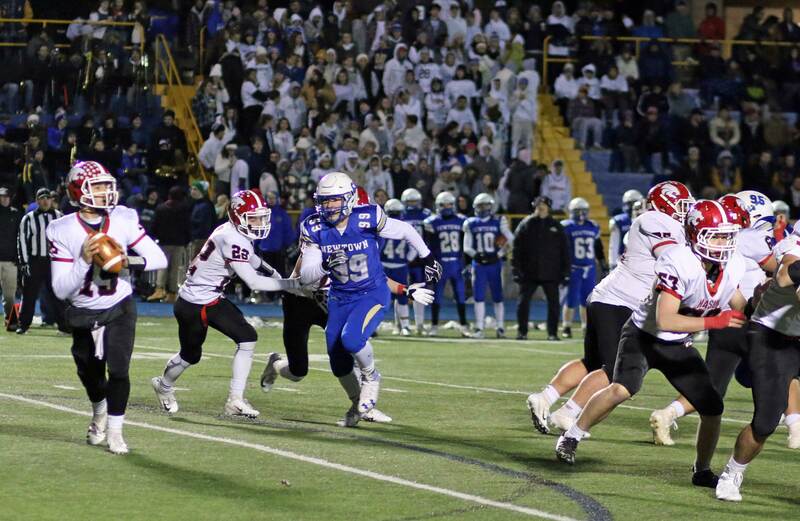 On this night it appeared that Masuk expected the Nighthawks to run inside and committed heavily to that assumption. 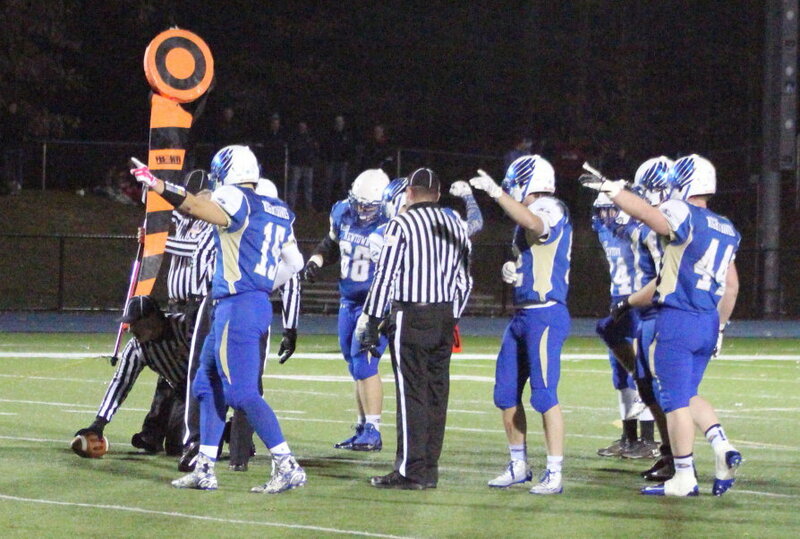 Unfortunately, for the Panthers, Newtown opted to attack the outside edges from new formations with a new back. Five touchdowns in the first half spoke clearly of the rousing success of the Newtown approach. Ben was able to get to the outside three different times with blockers looking in vain for Panthers to block on touchdown runs. Only the sideline official ran with Ben the final twenty yards. It was that kind of night. Key moment? After the first Ben Mason TD, a penalty forced a longer than usual extra point attempt that was missed by Ryan Kost. Trailing just 6-0, you could envision Masuk evening the score and getting ahead with a PAT. What happened? 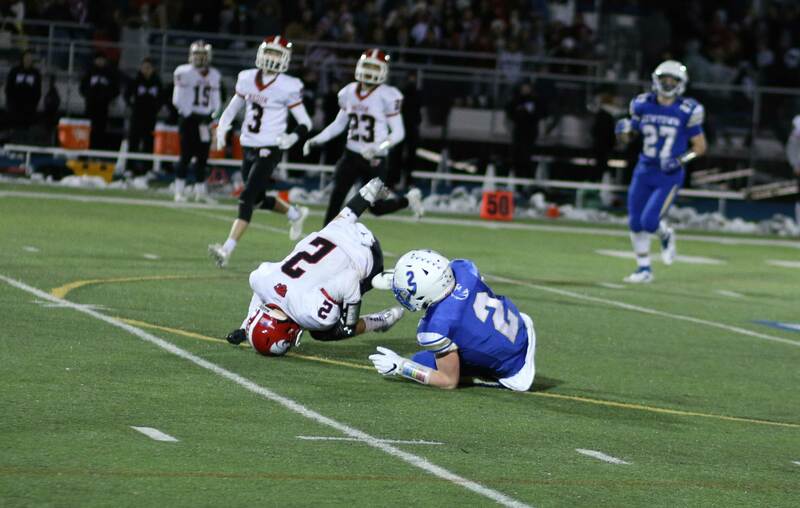 Ryan Kost’s kickoff hit the ground and for some reason wasn’t picked up (fallen on) by any of the Panthers including nearby Collin Briganti. Aggressive Mike Doyle fell on the free ball setting Newtown up at the Masuk 21. So instead of having the ball and a chance to tie or go ahead, the home team was back on defense. 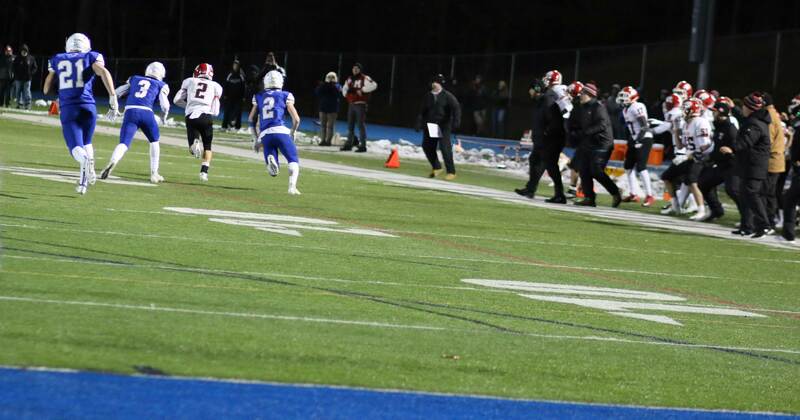 Before you knew it, QB Justin Dunn connected with Ben on the right and the talented senior crossed the field to the left corner for his second score. 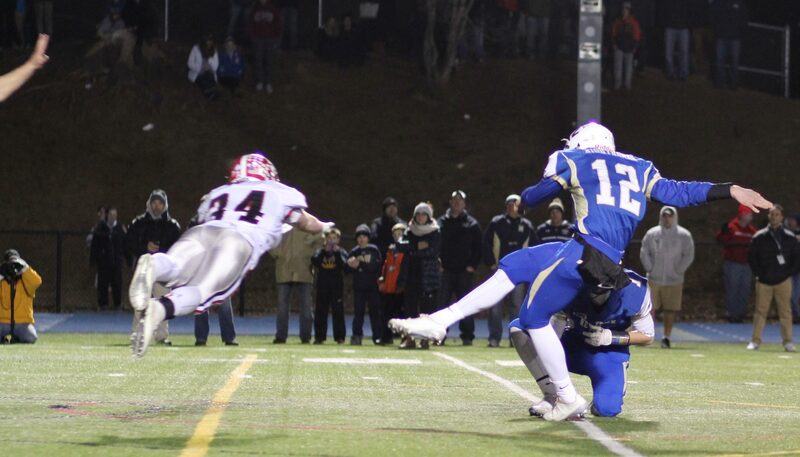 This turn of events started Masuk’s downhill slide that put Newtown in total command (34-0) by halftime. Many in the crowd chose the exits over another half of one-sided football. Masuk finishes their season at 6-4. A promising 6-of-7 start turned into a season-closing three-game losing streak. 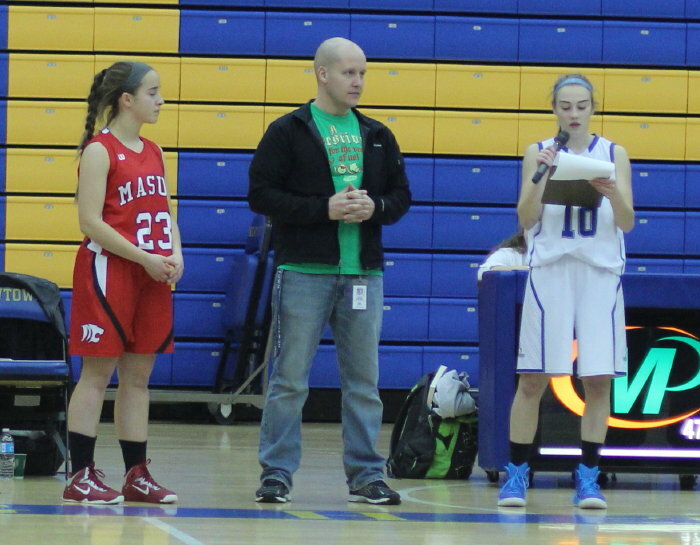 Seniors from Masuk were honored before the game. No sign of Newtown’s Hunter Cobb or Jared Pearson in this one. Ethan Carpenter left the game early with a leg injury. The Nighthawks (9-1) played without Hunter and Jared in the loss to Fairfield in their previous game. 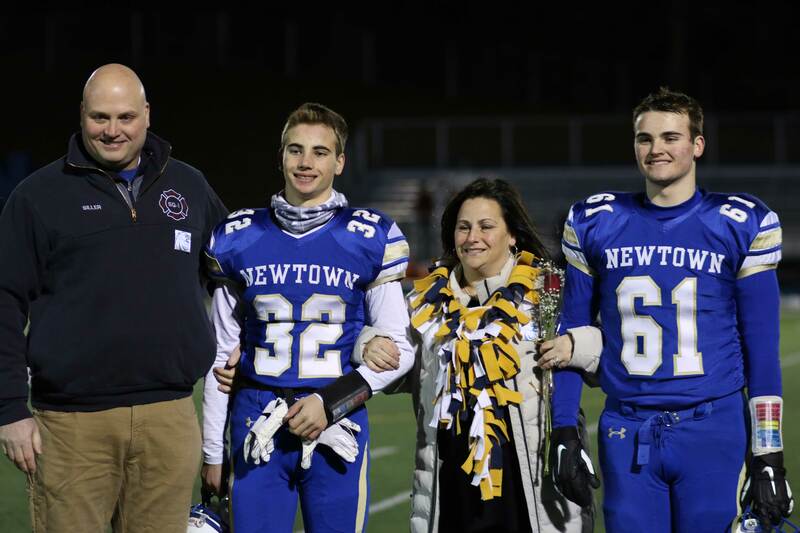 The setback ended a string of 40 straight wins for Newtown during the regular season in the South-West Conference. 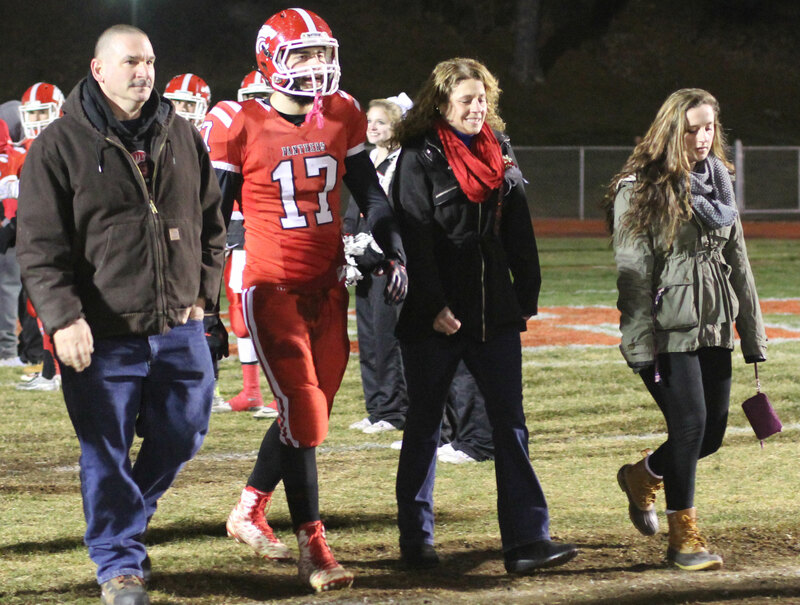 Senior Mike Doyle had a memorable game……..158 yards, 10-yard TD, and fumble recovery. 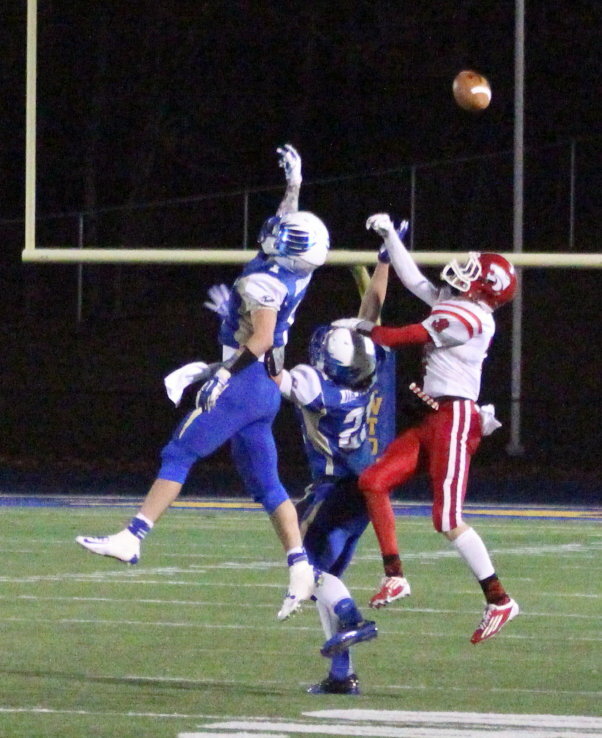 The Nighthawks had two first-half interceptions including one on the goal-line. For those of us easily confused, the program was a problem. There were two #5’s for Newtown as well as an unlisted #8. 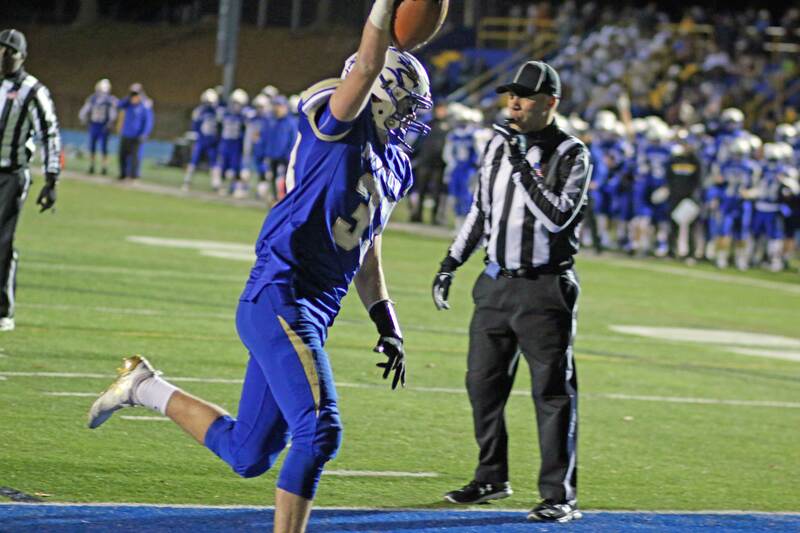 #8 turned out to be Nick Samuelson whose number was changed from 52 because he was getting some reps on offense. 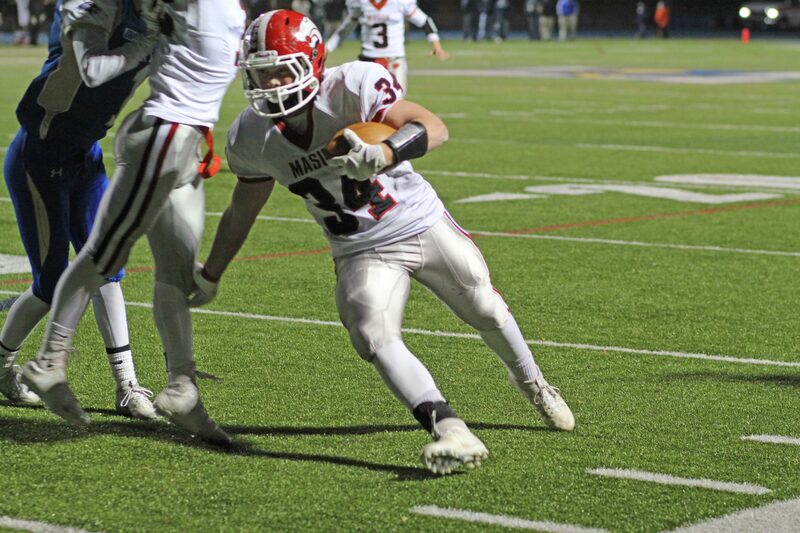 Masuk’s Nick Dellapiano added to his impressive total yards (1415) getting a 45-yard score from QB Matt Hersch in the third period. 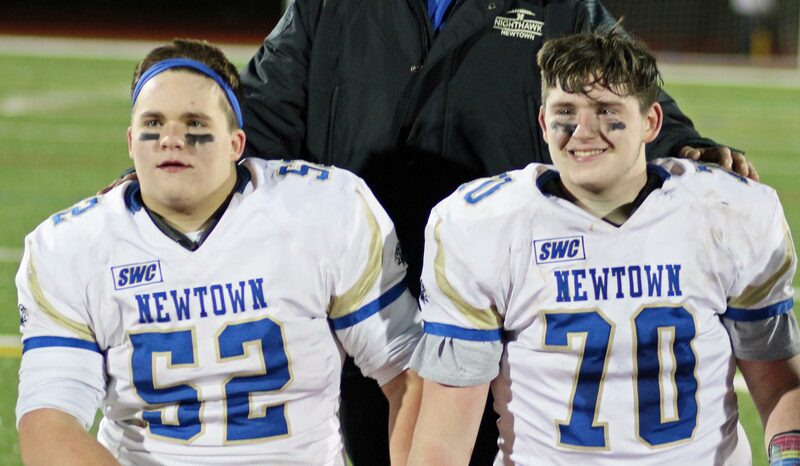 Newtown’s last state title was in 1992. I would like to think that a title in 2015 could happen. 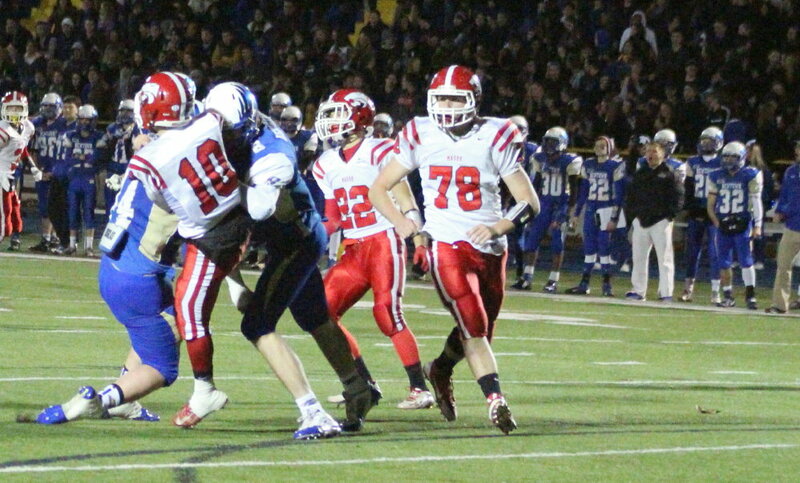 The last Masuk win in their series with Newtown was in 2011. 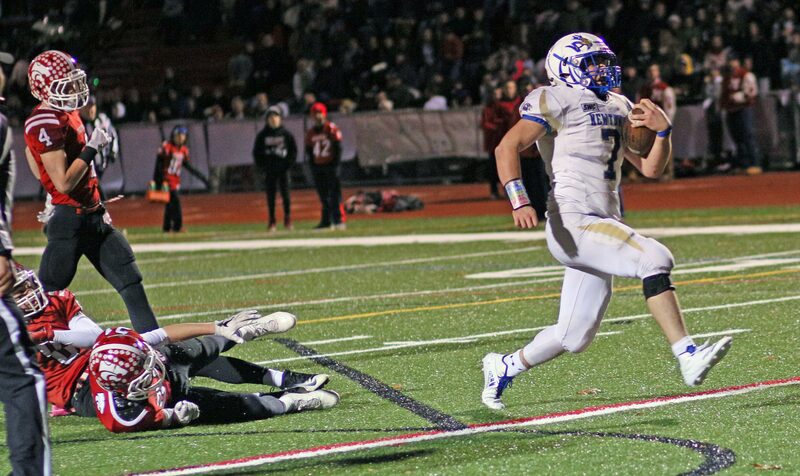 On that evening at Newtown the Nighthawks had no answers for Casey Cochran and the Panthers. It was a mismatch similar to the 2015 version. 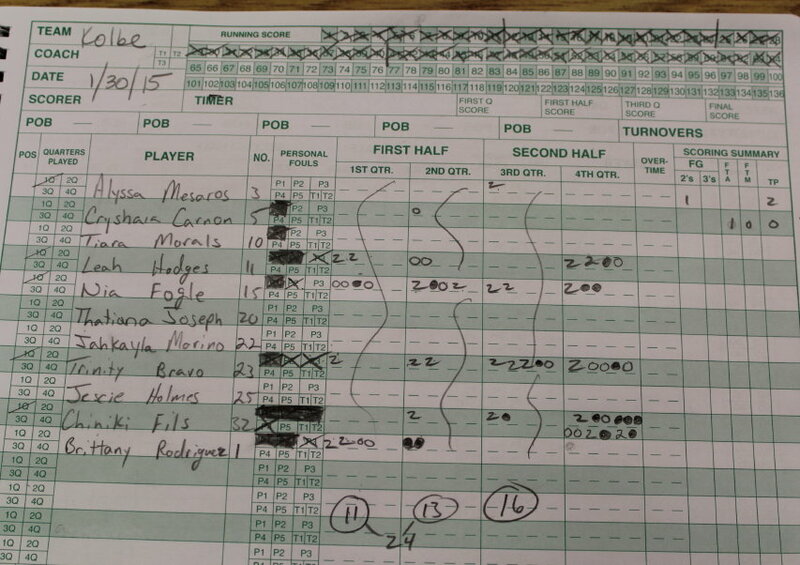 (Monroe CT) A strong second half enabled Kolbe-Cathedral to defeat Masuk, 64-50, on Friday night at Masuk. 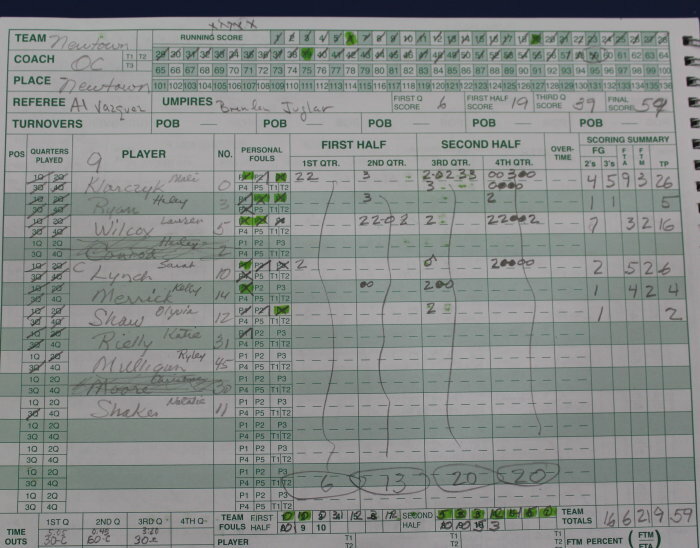 The Cougars (7-7) trailed by nine (33-24) at the half but poured in forty points in the second half to win going away. 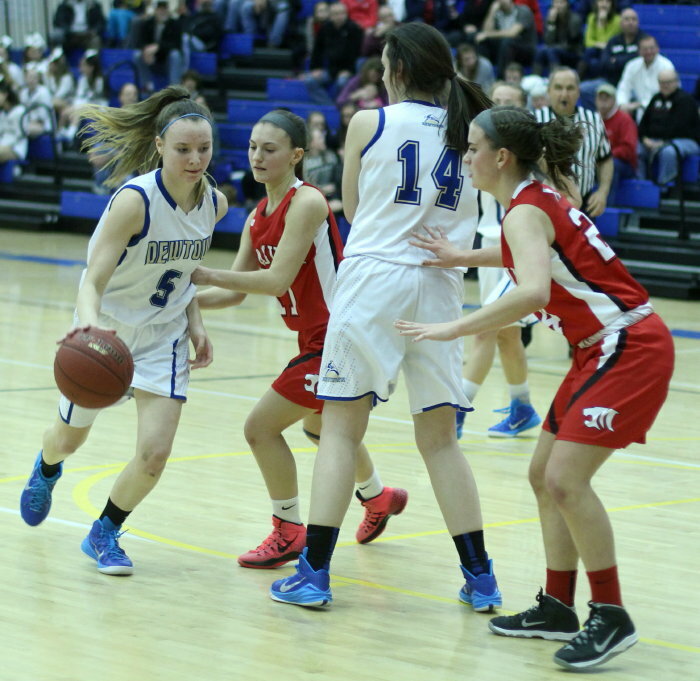 The two teams had met on January second at Bridgeport with the Cougars rallying to win by a point (68-67). 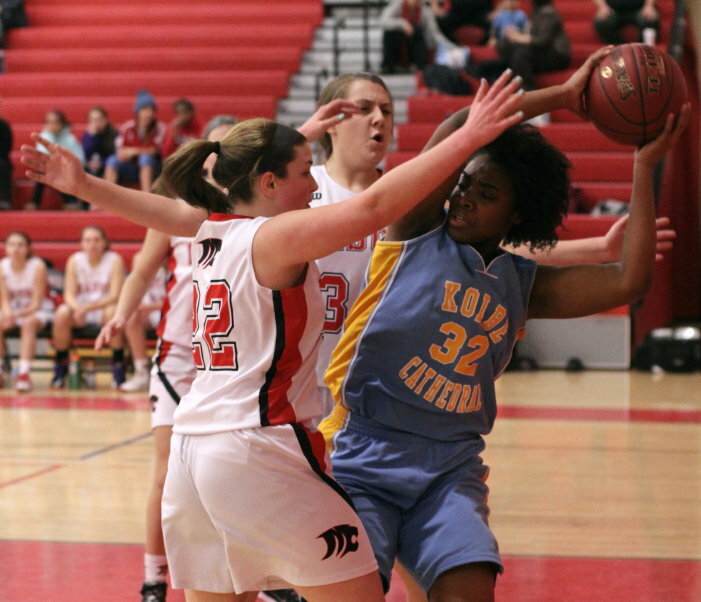 KC had been down by ten in that one but came back, as they did in this one, to get the victory. 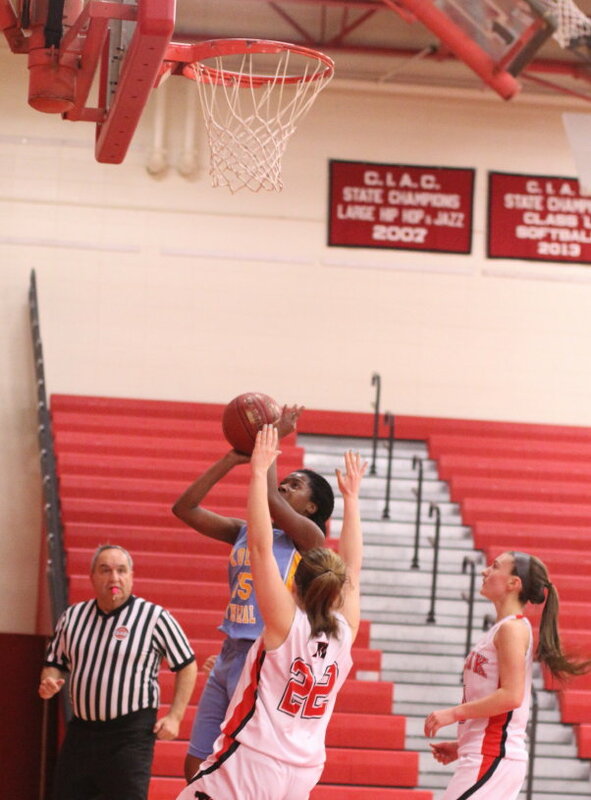 Chiniki Fils (17 points) led all scorers and collected twelve of her points in the 4th quarter. 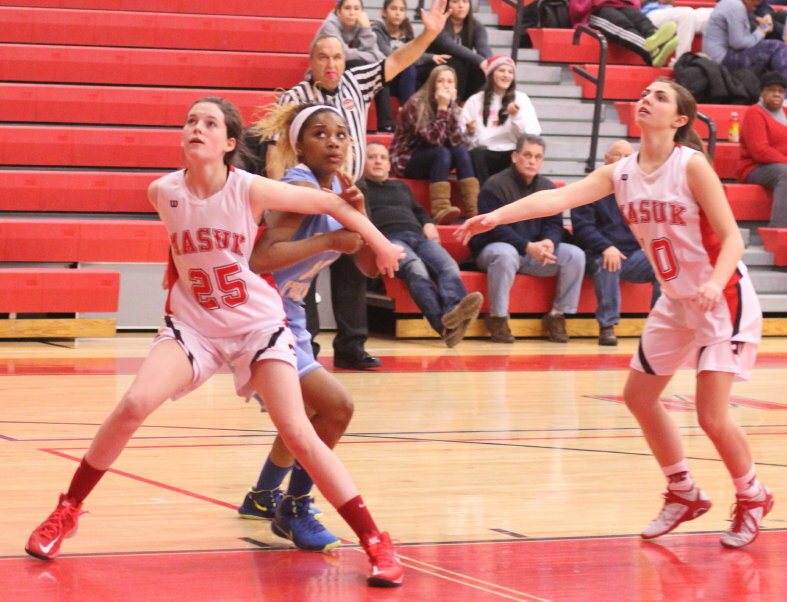 Masuk had no defensive answers for her around the basket. When Chiniki went to the bench with her third foul with 4:44 left in the second quarter the Cougars trailed by a point (18-16). 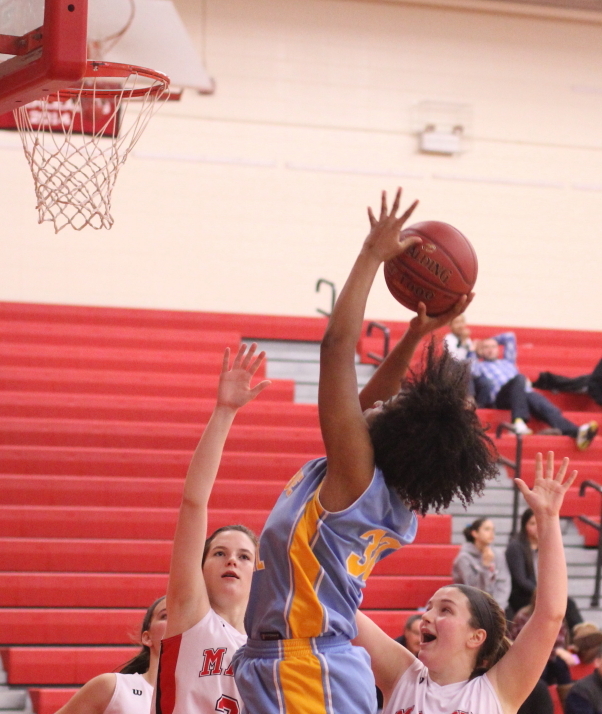 The Panthers, led by freshman Callie Engle, dominated the rest of the second period and led, 33-24, at the half. Masuk (6-9) full-court pressure was working (15 KC turnovers) and the home team was able get high percentage shots in close. All that changed in the second half. 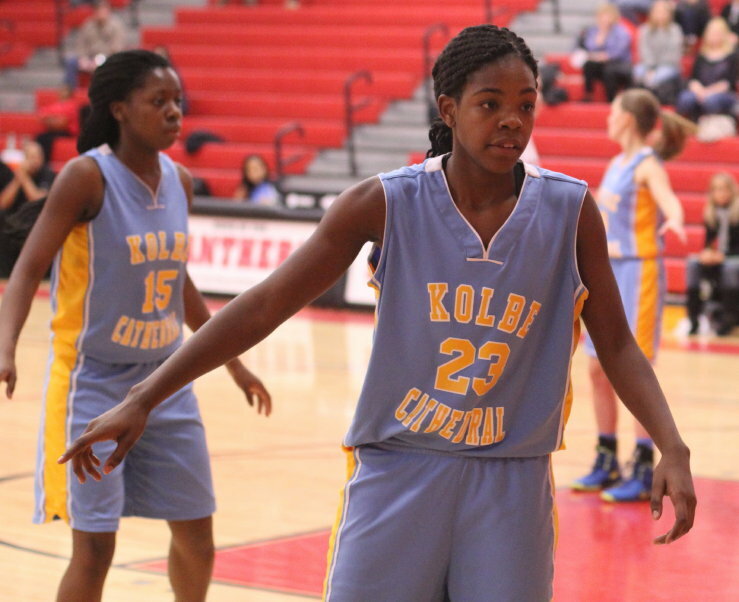 Kolbe started and ended the third quarter with six unanswered points forcing turnovers and getting to the basket. 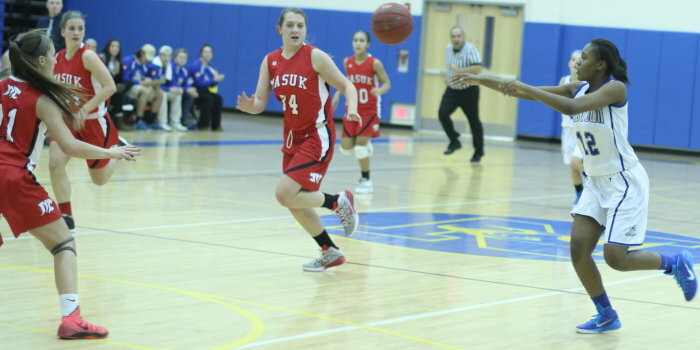 Freshman Trinity Bravo (14 points) had several steals, baskets, and assists while Masuk suffered through a 4-point quarter. Panthers coach Alyssa Laczkoski lit into her team after the disastrous third but things didn’t get better. Kolbe put eight straight together on three layups and a rebound basket to get up by nine (48-39) with 5 1/2 minutes left in the game. Jana Migliaro later his three free throws to get Masuk within five (51-46) with 4+ minutes left. Time was there to finish the comeback but Chiniki Fils had five free throws and two layups the rest of the way to seal it for Kolbe-Cathedral. 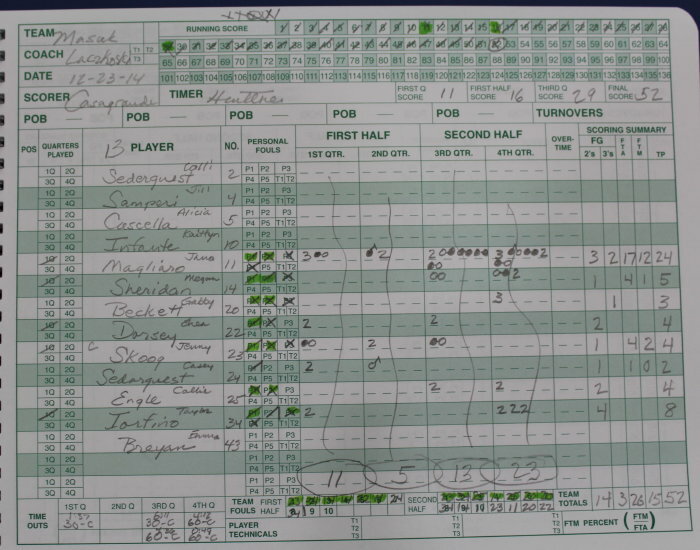 The Cougars won their third straight despite missing seventeen free throws (16-for-33). 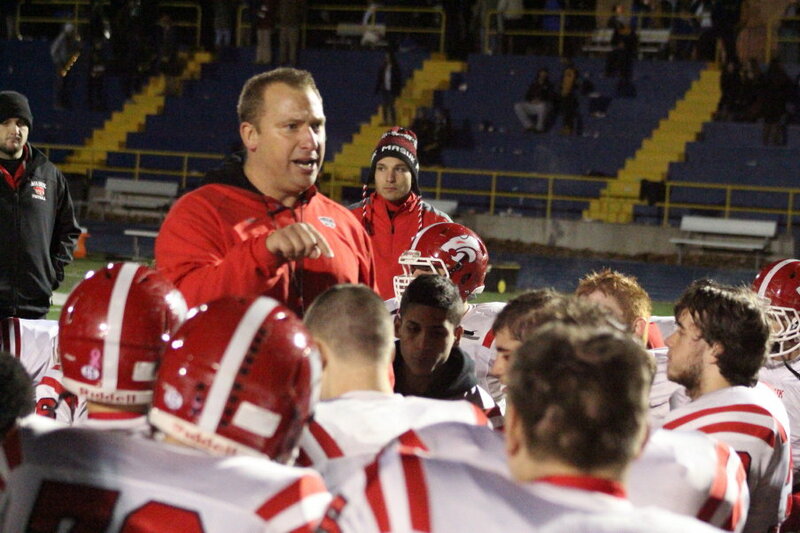 Masuk ended up with twenty-six turnovers. Many of the miscues led to immediate KC baskets. 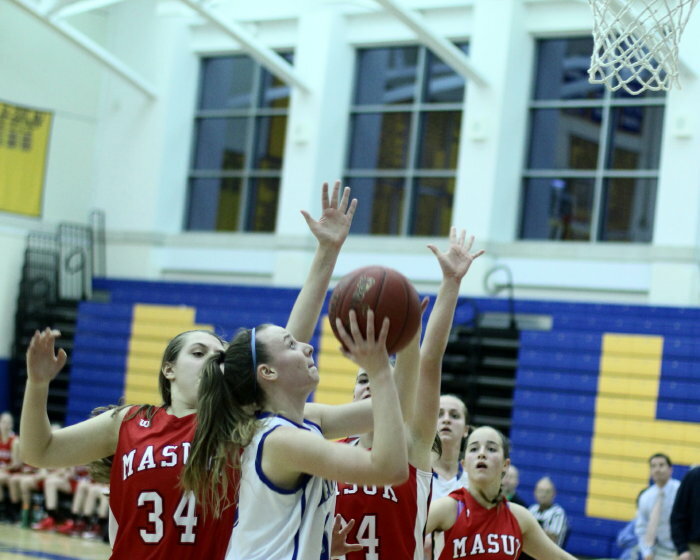 Callie Engle had eight points in the second quarter for Masuk. 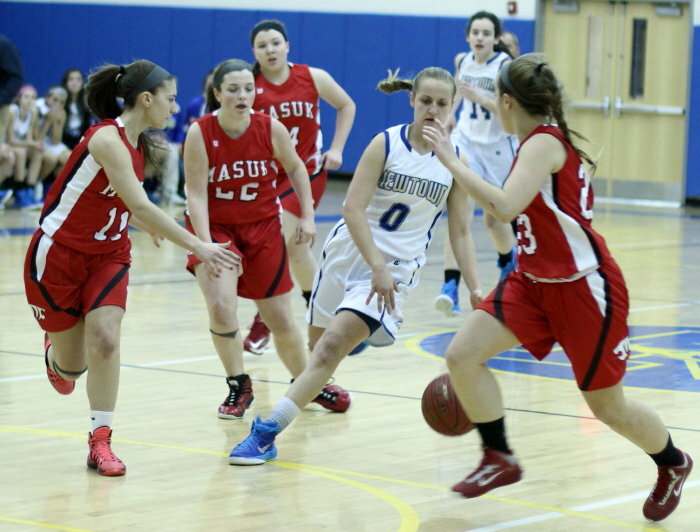 Jana Migliaro (11 points) made one three despite numerous attempts. Coaches on the KC bench were yelling “Shooter” every time the senior co-captain touched the ball. 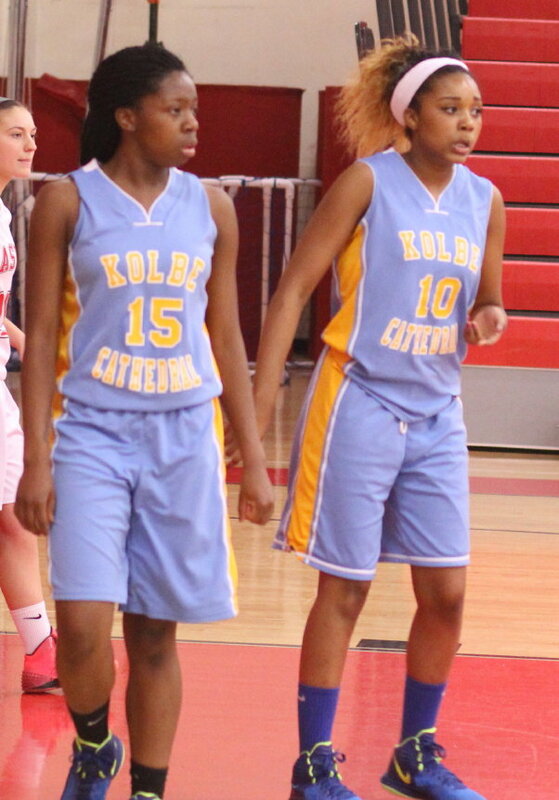 Senior Nia Fogle and freshman Trinity Bravo both had fourteen points for the Cougars. Masuk hadn’t played in a week. That was why I was surprised at how well they played in the first half. Pressure works so much better when it gets set up after a made shot. 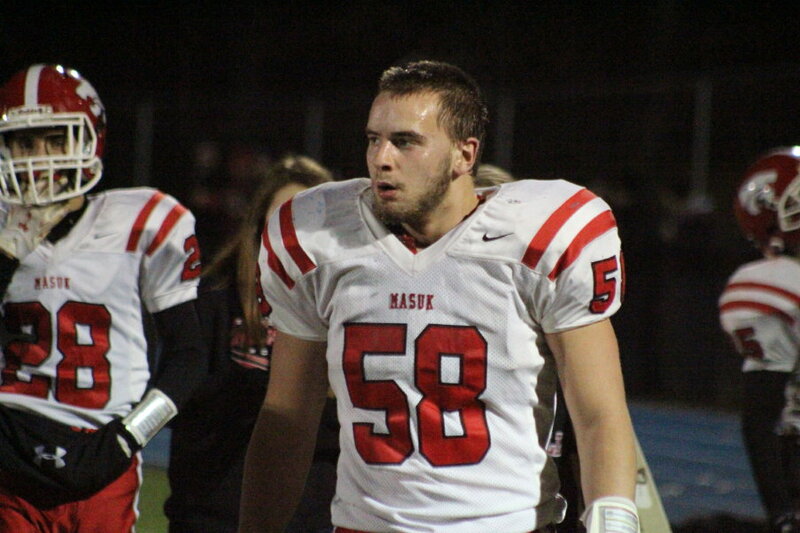 Masuk has lost four of their last five games. 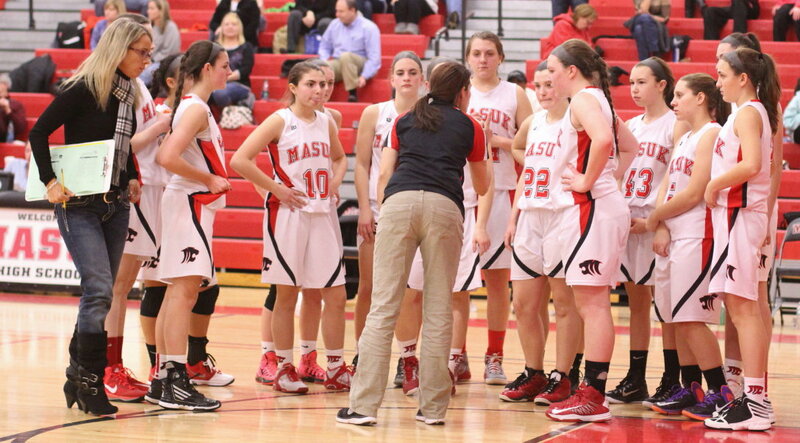 Next for Masuk is a trip to Brookfield on Tuesday. The Panthers won the previous meeting at home. The Cougars will be hosting Joel Barlow on Monday. 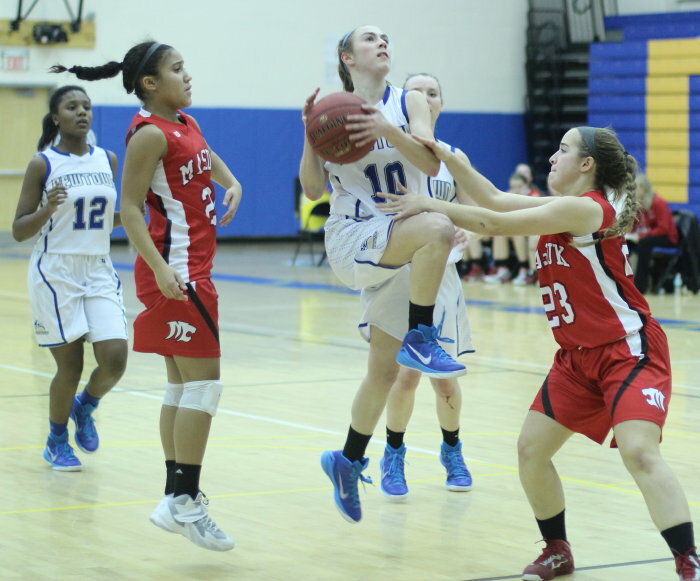 (Newtown CT) Jana Migliaro (24 points) and Mali Klorczyk (26 points) put on quite a show. In the end it was Mali’s Newtown Nighthawks defeating Jana’s Masuk Panthers, 59-52, in a non-league girls’ game on Tuesday night. Newtown (4-1) took the lead for good in the second quarter on a three by junior Haley Ryan. 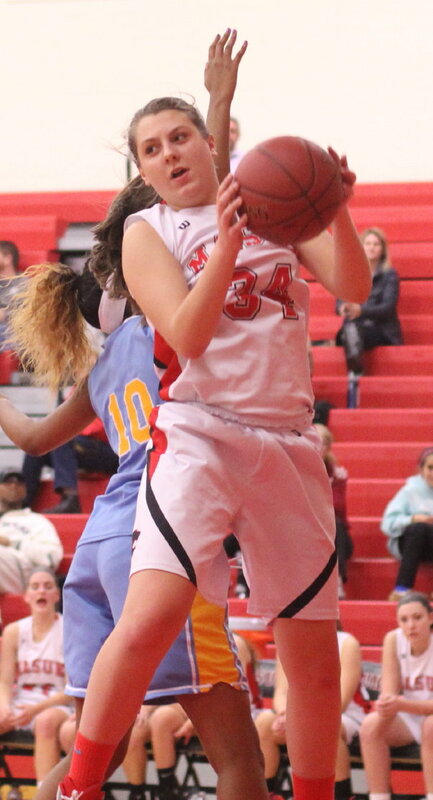 Mali Klorczyk drained three 3’s in the third period to raise the N’Town advantage to thirteen but Masuk (1-3) rallied back. Seven unanswered points to start the final quarter had the Panthers one shot away at 39-36 with six minutes to play. 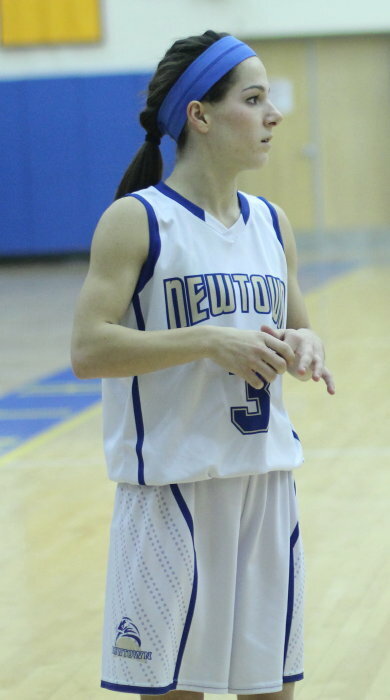 Newtown, however, answered immediately with seven straight points featuring Mali Klorczyk’s fifth 3-pointer and pushed the Hawks’ lead back into the ten-point comfort zone. The pace was hectic throughout. In the first half the pace troubled both teams as there were missed shots and turnovers galore. The teams combined for fifteen turnovers in the first quarter alone. Newtown led, 19-16, at the half. The Hawks put Masuk in some serious trouble in the third quarter with eleven straight points in a two-minute segment. 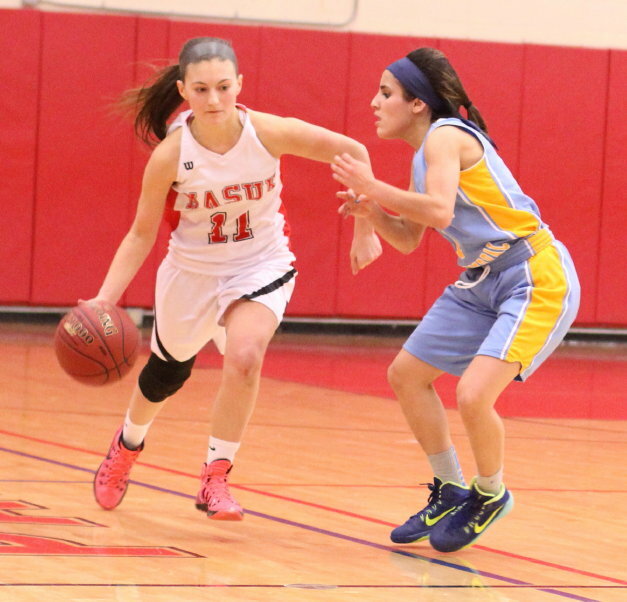 Mali Klorczyk converted a rebound and nailed two straight three’s during the breakaway run. Mali ended up with thirteen points in the quarter. 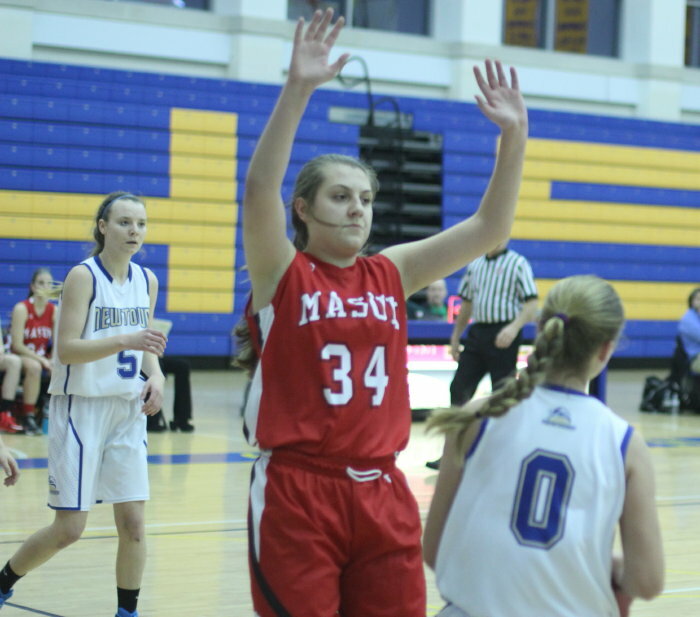 Senior Jana Migliaro did her best for Masuk to keep the Panthers in the game. 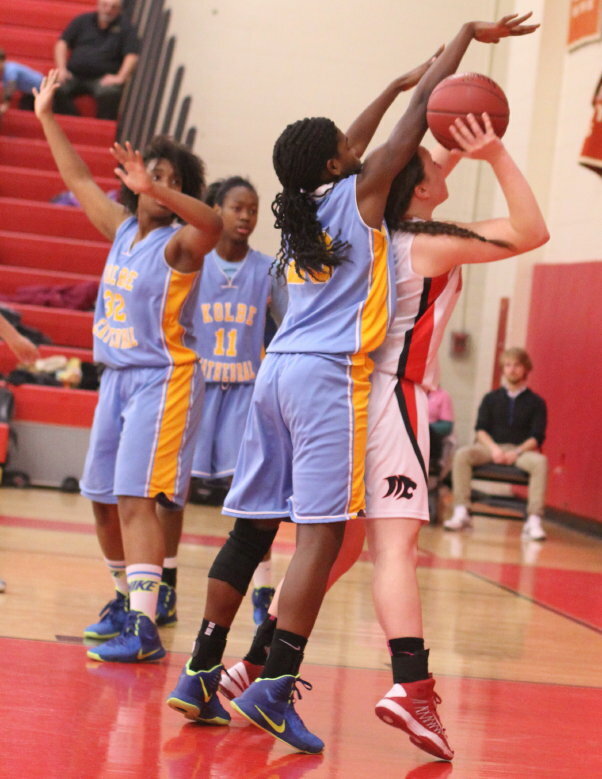 She made three’s, drives, and free throws while every Hawk seemed to take a try at containing her. She drove fearlessly and ended up making twelve free throws. I was impressed with the Newtown passing in the second half. With Masuk trapping the ball, there were openings to be found in close with consecutive passes. Lauren Wilcox (16 points) cashed in from in close seven different times. The basketball games I see (in Massachusetts) are played with a shot clock. Without that clock, teams have to be able to pressure an opponent and be able to handle pressure. A coach where a shot clock is used (Massachusetts) can hide players on offense or defense but not in Connecticut. I liked the idea of having team captains (Sarah Lynch and Jenny Skoog) recite the crowd conduct requirements before the game. 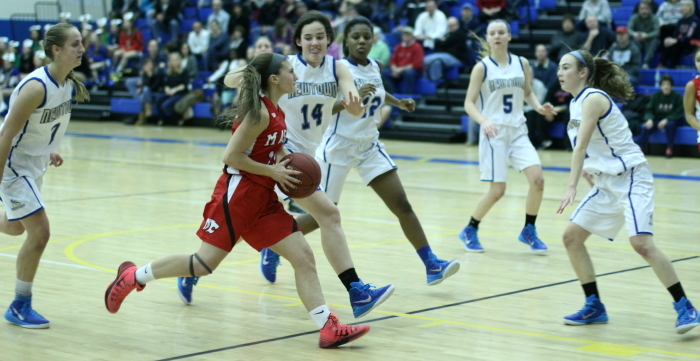 Kelly Merrick went out in the third quarter with a leg injury. 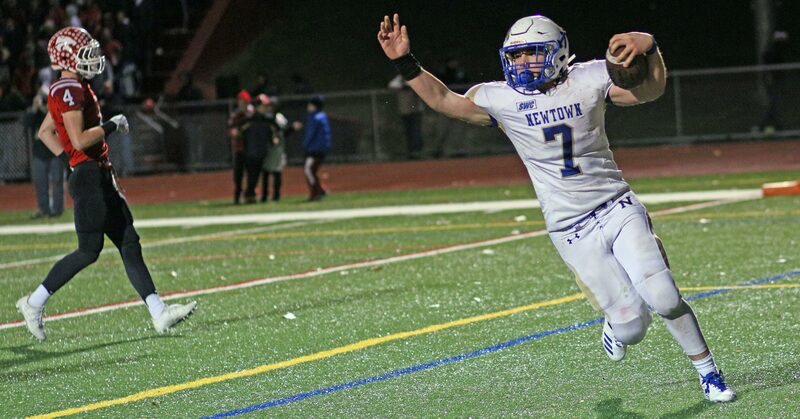 Newtown was 10-11 last year after winning the state championship in 2012. This year’s team has one senior (Sarah Lynch). The 2014-15 Hawks could be headed for some good things in the post-season if tonight’s combo of speed, passing, defense, and 3-point shooting gets perfected. Underwhelming foul shooting by both teams. 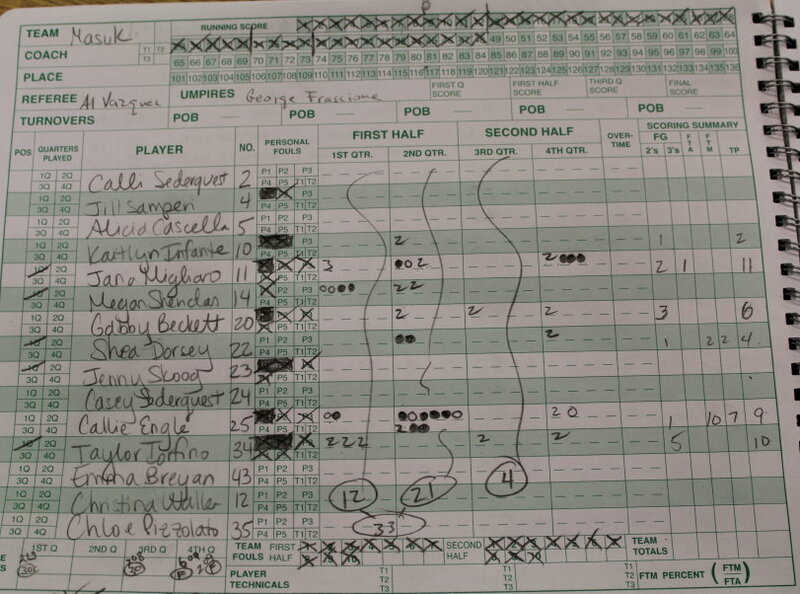 Newtown was 9-for-21 while Masuk was 15-for-26. My theory on poor foul shooting is that players practice 3-point shooting a lot more than free throw shooting. I continue to be surprised by the number of baskets scored on inbounds plays. Next game for Masuk is hosting Bethel on Saturday at 7PM. 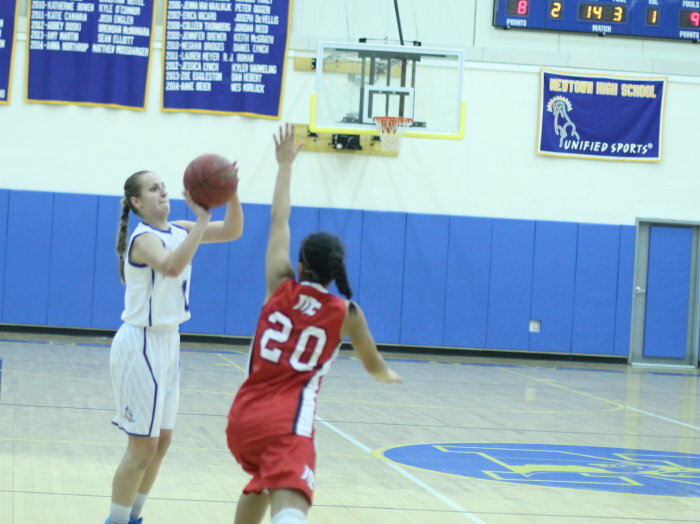 Newtown returns to action on January 3rd on the road at Saddle River School in New Jersey. 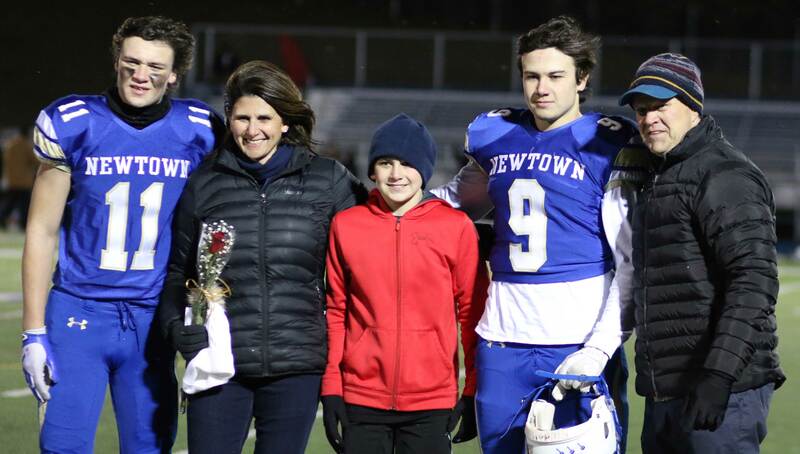 (Newtown CT) “Julian Dunn has done some amazing things for Newtown football,” said Nighthawks coach Steve George on Tuesday night after the game. It’s probably a line that the NHS coach has used regularly when asked about the talented senior. 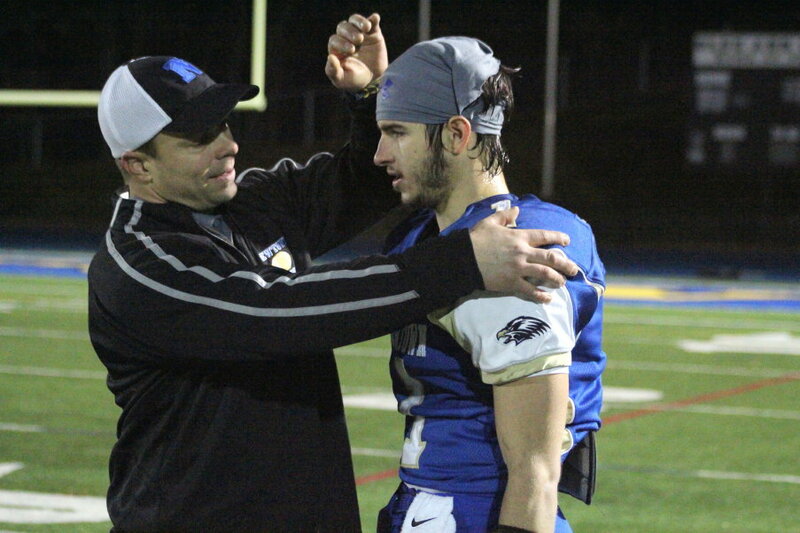 Julian was key to the Newtown victory over Masuk, 28-7, in the rescheduled Thanksgiving Eve game. 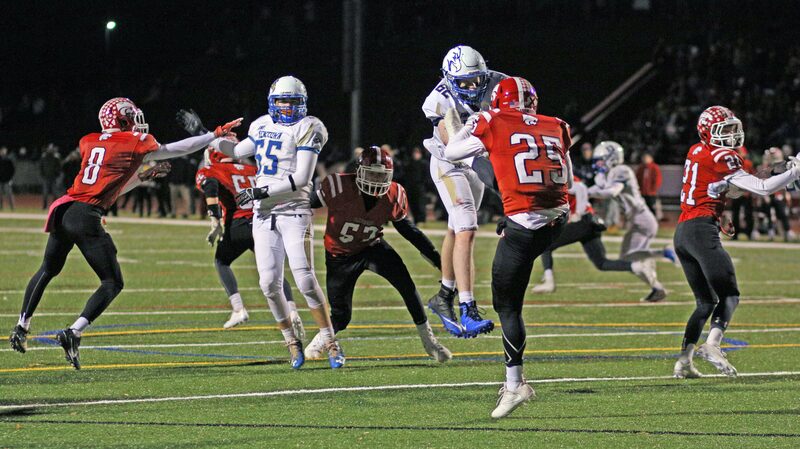 In the midst of a terrific catching/kicking/defending performance, Julian slipped into the Connecticut high school record book. He entered the game tied with Aaron Hernandez (Bristol/Florida/Patriots) on the all-time list of touchdown catches with 47 but by game’s end had added two more to his total. With at least one more game left, and possibly two, his totals could increase. The final score in this game was very misleading. At first glance you’d suspect that undefeated Newtown dominated 7-4 Masuk. You would be wrong……….at least during the first half. The second half? All Newtown. 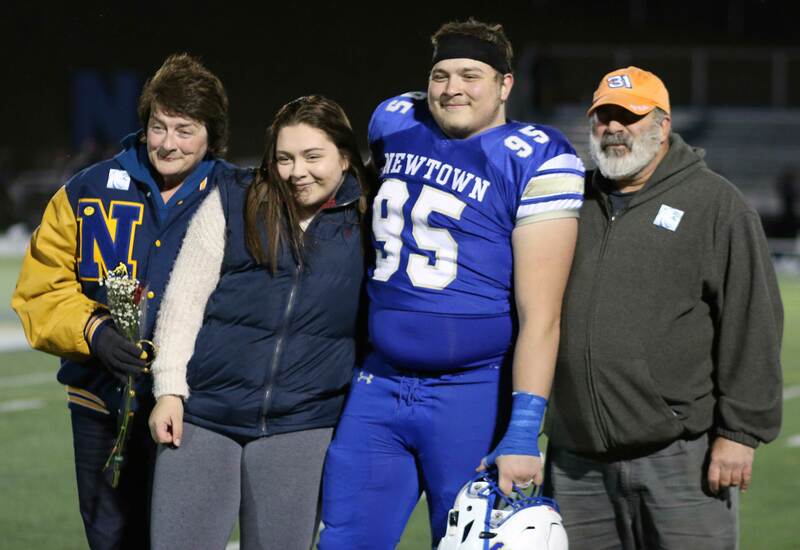 Because Newtown was in the South-West Conference championship game on Saturday, they only had a few days to get ready for Masuk. The Panthers, on the other hand, had over a week. And sure enough he did. It seemed to me that Newtown spent most of the first half trying to figure out where to line up defensively against a variety of formations. 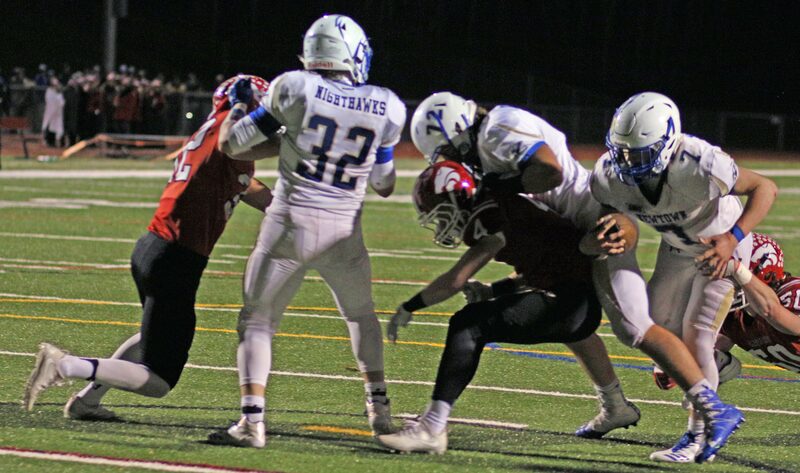 Underdog Masuk was not only able to move the ball but also overwhelmed the Nighthawks defensively with an assortment of blitzes. 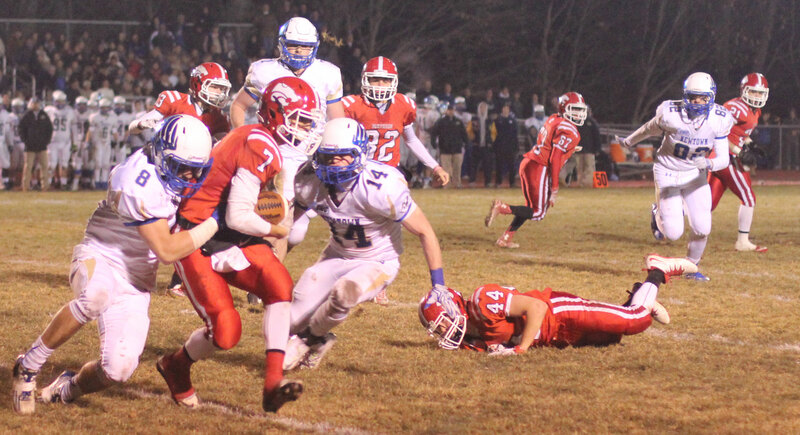 In that dismal first half, Newtown QB Jacob Burden was sacked and injured. Sophomore Justin Dunn came on and his first pass bounced off of the normally reliable hands of his brother Julian. Things were that bad! 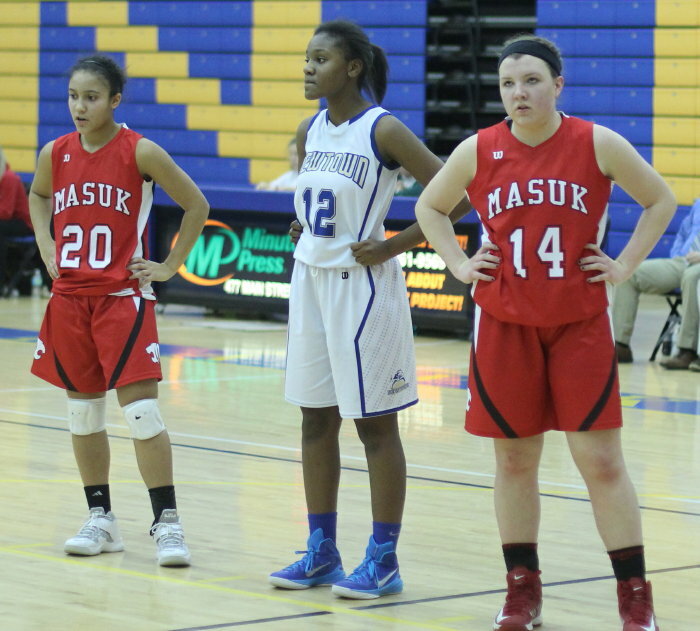 Masuk threatened to score in the first quarter but the drive petered out at the Newtown 19. In the second quarter the Panthers took the lead. 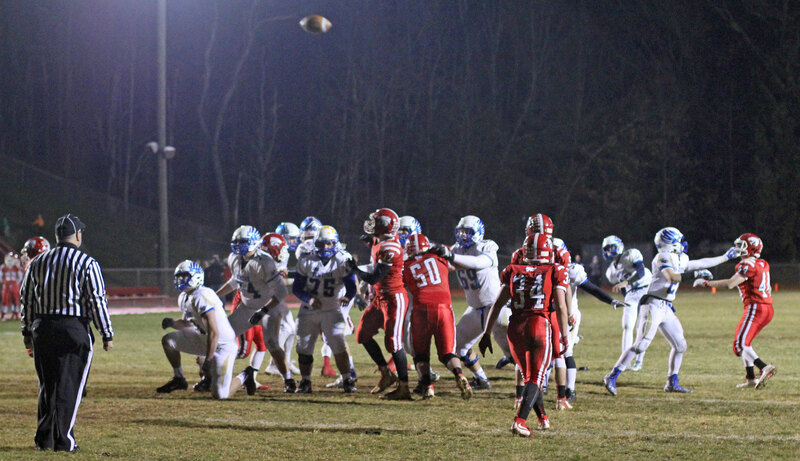 A fake punt by Newtown failed and the visitors from Monroe had a short field to work with. The big play in the scoring drive was a nifty 25-yarder by quarterback Zach Kaufman. Zach started left and then cut back across the middle of the field. 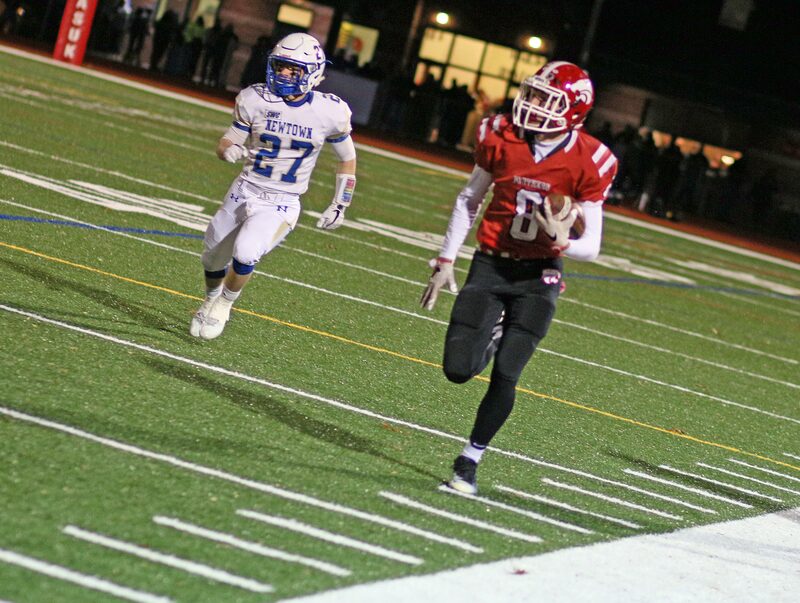 Sophomore Nick Dellapiano finished the job for Masuk running a reverse to the right from seven yards out at 8:16. The second half was a whole new ballgame! Masuk’s 7-0 halftime lead vanished on Newtown’s first possession and the Nighthawks had answers for the Panthers “funky” formations thereafter. Julian Dunn jumped ahead of Aaron Hernandez in TD receptions on that first series. Julian lined up on the right and slanted into the middle. His brother Justin’s pass hit him in full stride. Julian (6-3/230) bounced off safety Bryan Acevedo for the 16-yard record-setting tally and the score was tied after the extra point. 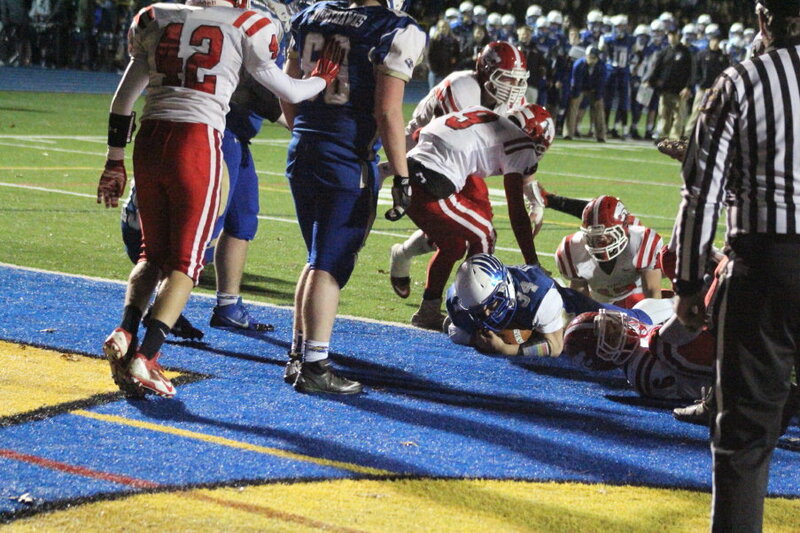 With the score now tied, Masuk took a huge chance on 4th down deep in their own territory. 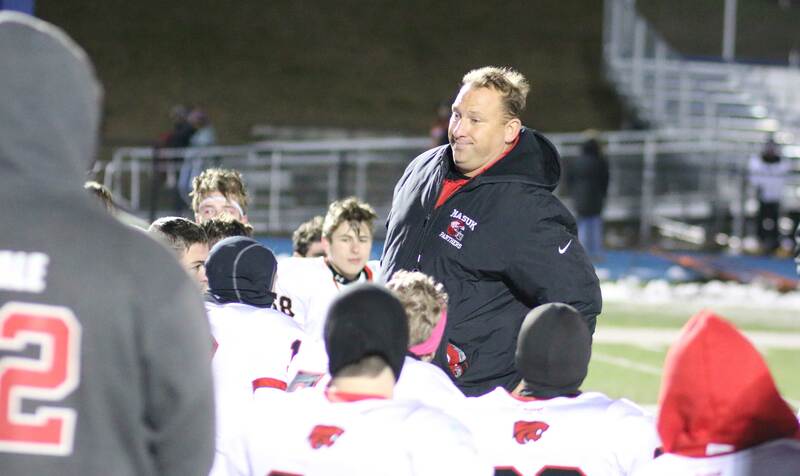 Coach Lato said afterwards that, “he saw the momentum changing and wanted to stop it.” Keeping a drive alive at the Masuk 34 on a 4th-and-one seemed do-able after a great first half, but after a timeout, an inside run was stopped cold. 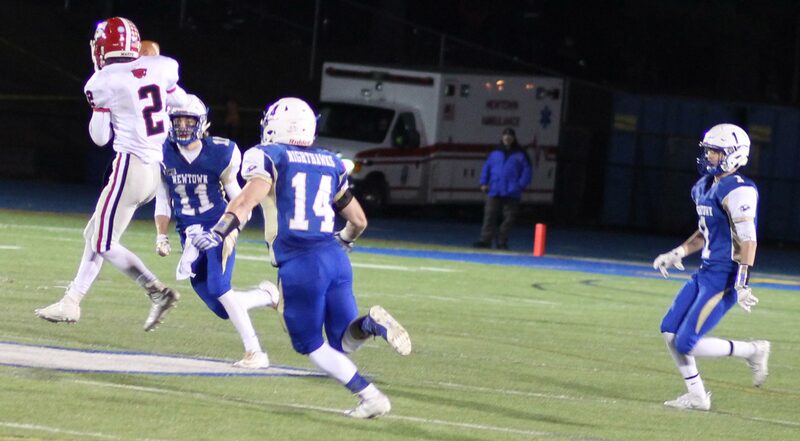 Newtown quickly capitalized on the field-position gift with a nice run by sophomore Hunter Cobb setting up the Nighthawks at the Masuk 10. It wasn’t hard to figure out what would happen next: Julian Dunn slant over the middle. Newtown was now up 14-7 with 6:32 remaining in the second quarter. 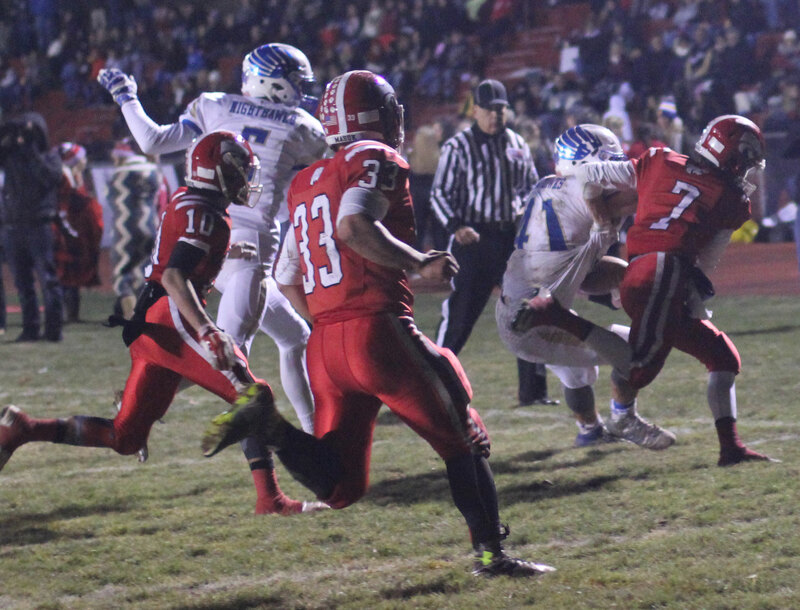 Masuk had bad field position most of the second half. 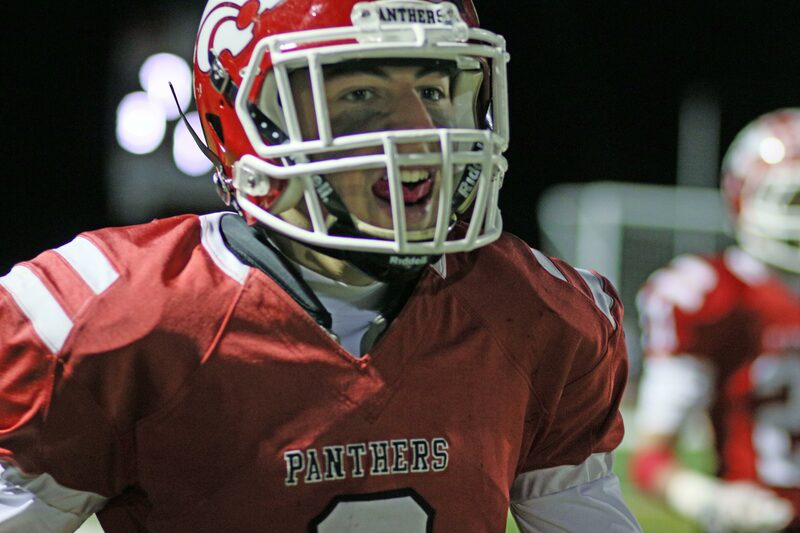 A short punt early in the final quarter, followed by a long Hunter Cobb run, had the Panthers on the Masuk doorstep. 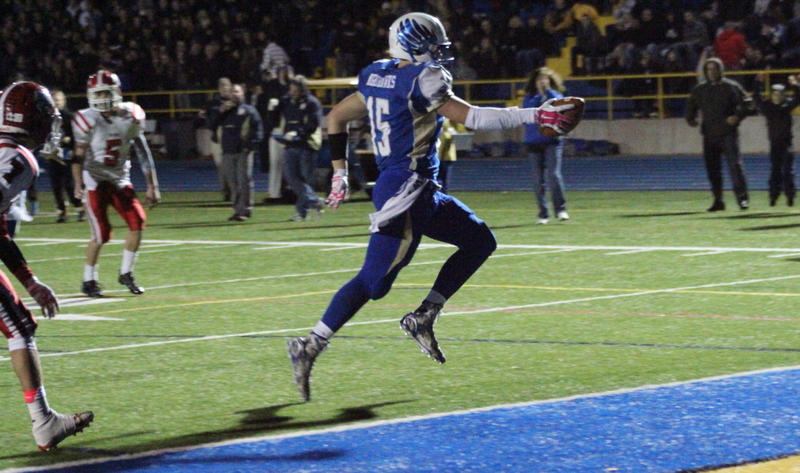 Two straight runs by Nick Rubino got him into the end zone for his 13th TD of the season. Worse field position set up another punt for Masuk on their next possession. 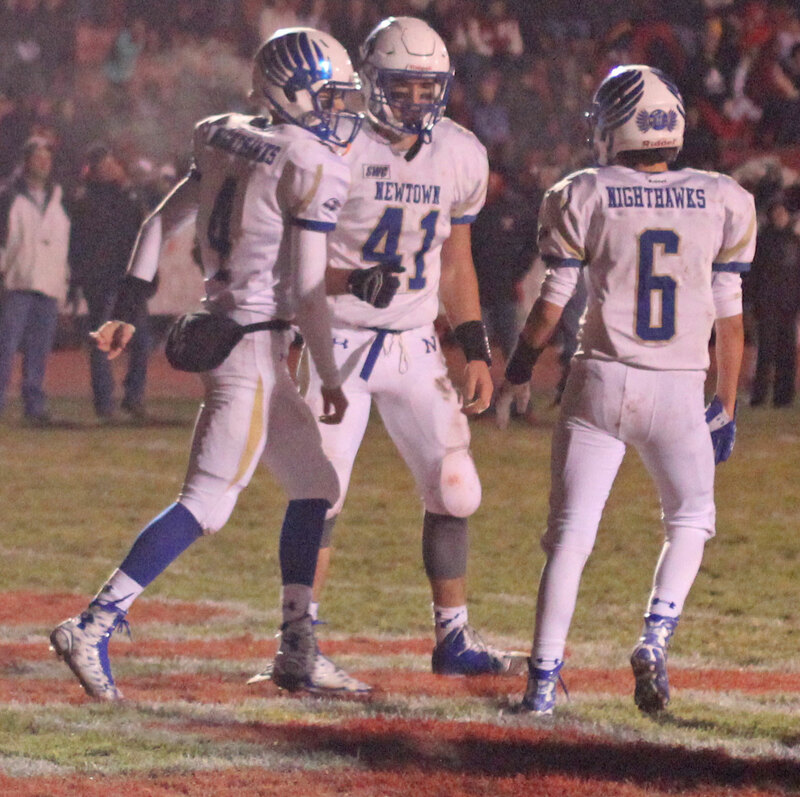 Senior Ethan Carpenter collected Bryan Acevedo’s punt at the Masuk 39 and shot straight up the wide-open middle. He was instantly alone and ended up with two blockers nearby, with no one to block, as he streaked across the goal line. Ethan’s TD was at 7:29 and put the Newtown at the final score of 28-7. 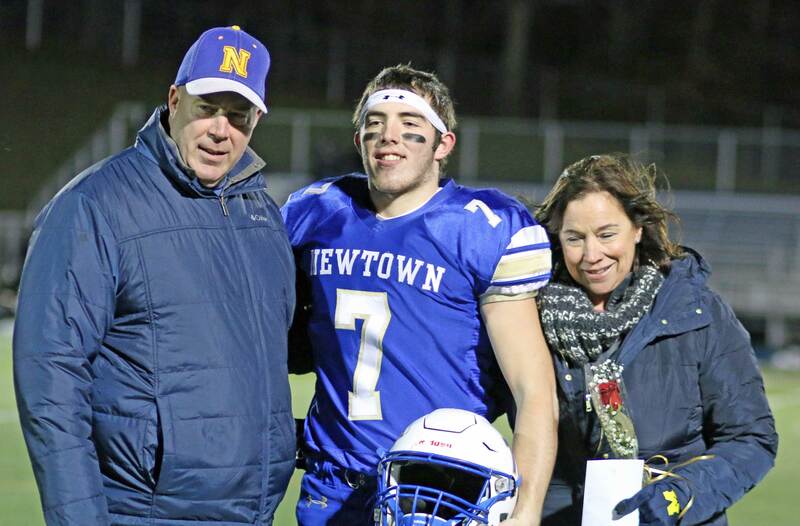 Running back Jaret DeVellis was in uniform for Newtown but didn’t play. “Jaret could have played but we wanted to do the right thing with him and give his ankle more time to heal,” said Coach George. I watched Jaret in pregame and, despite his best efforts, he still wasn’t running without limping. QB Jacob Burden didn’t return after his injury to his non-throwing left shoulder in the second quarter. “Jacob could have come back,” added Coach George. Good to see the players from both teams interacting pleasantly after the game. Weather was cold but with no wind. The impending snowstorm led to the game date change. Coach George broke the news to his team afterwards that there wouldn’t be any school Wednesday. 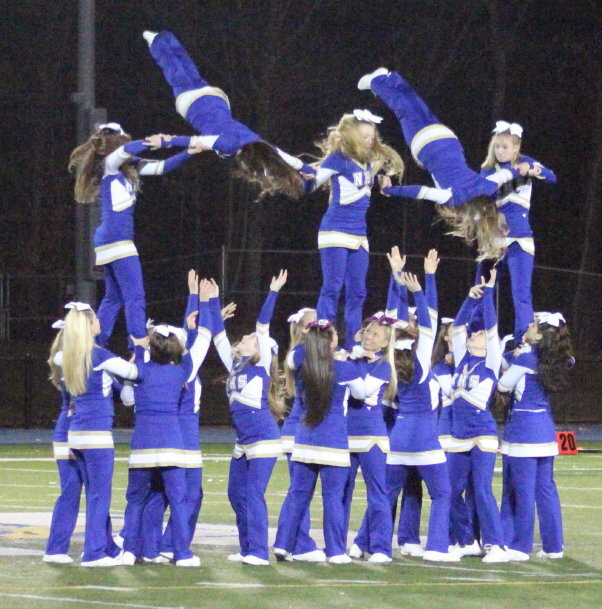 I continue to be very impressed with the performances of the Newtown dance team and cheerleaders. Their state-wide recognition is well deserved.